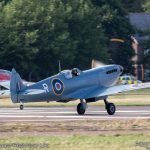 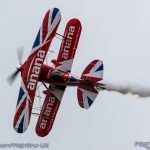 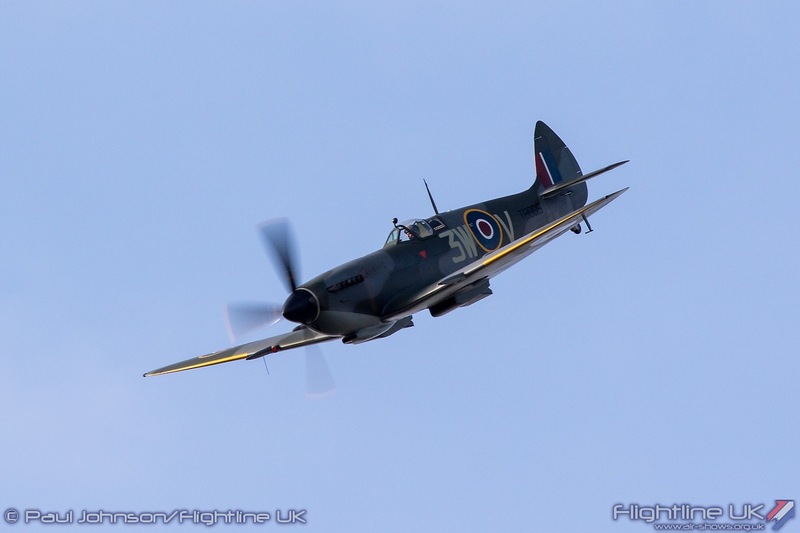 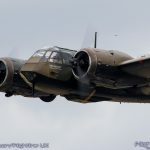 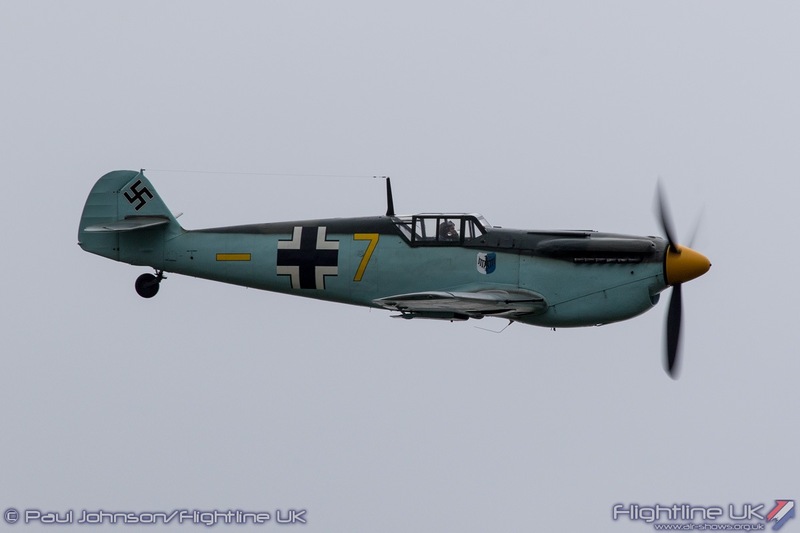 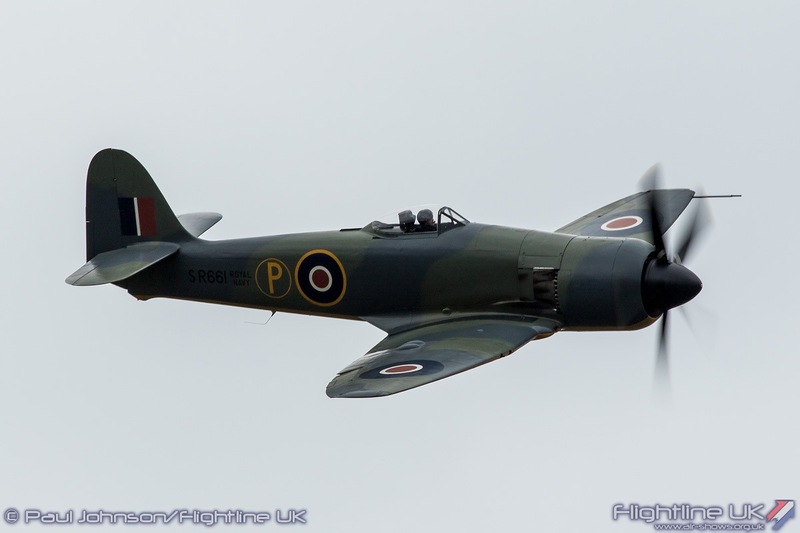 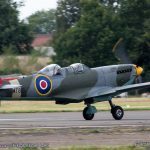 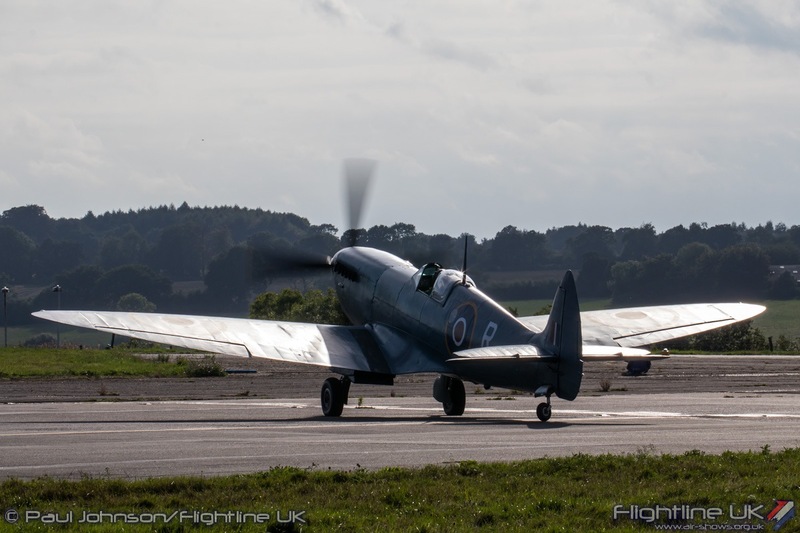 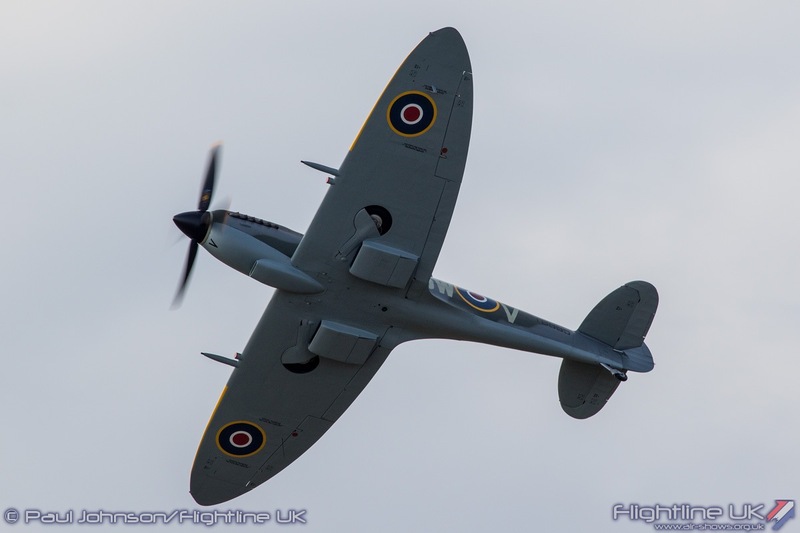 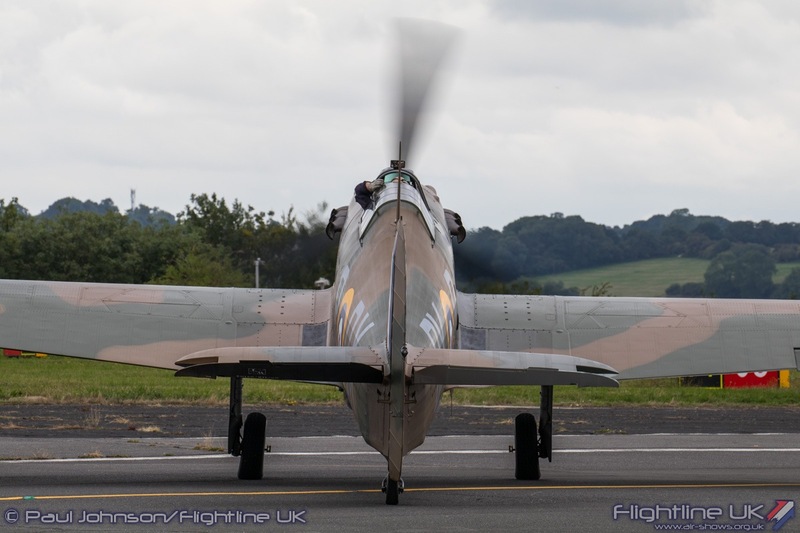 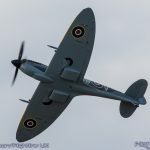 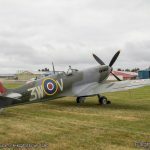 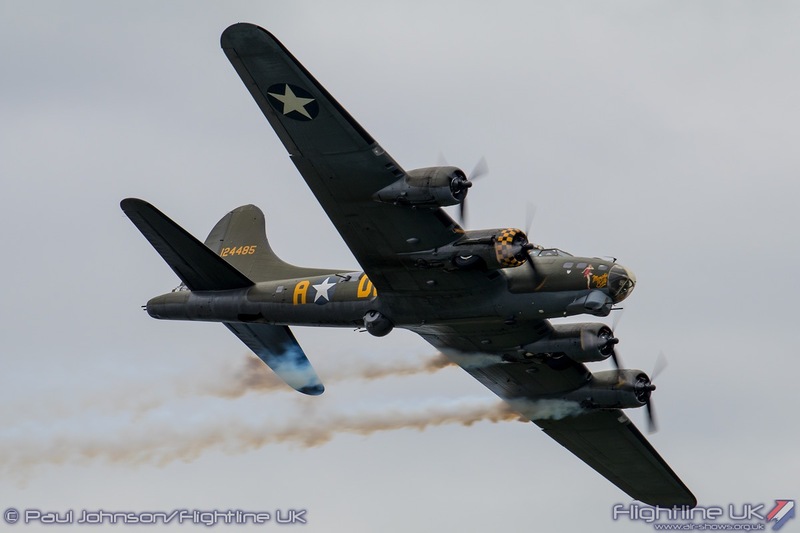 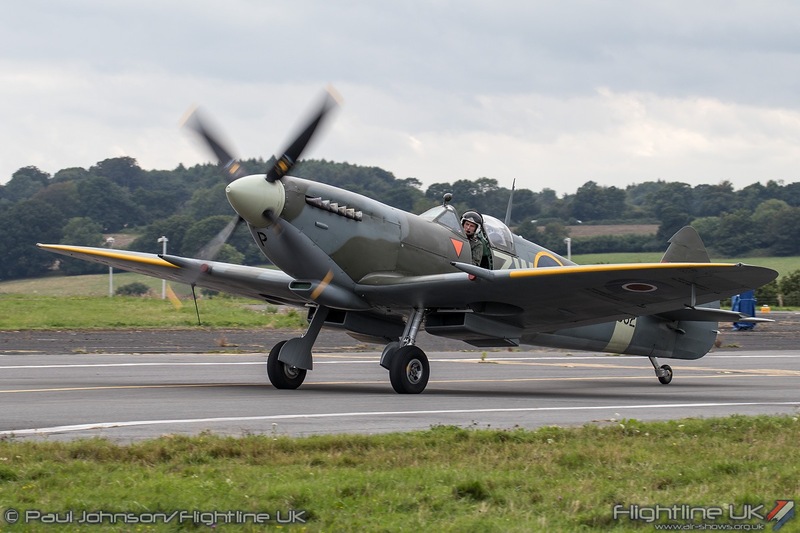 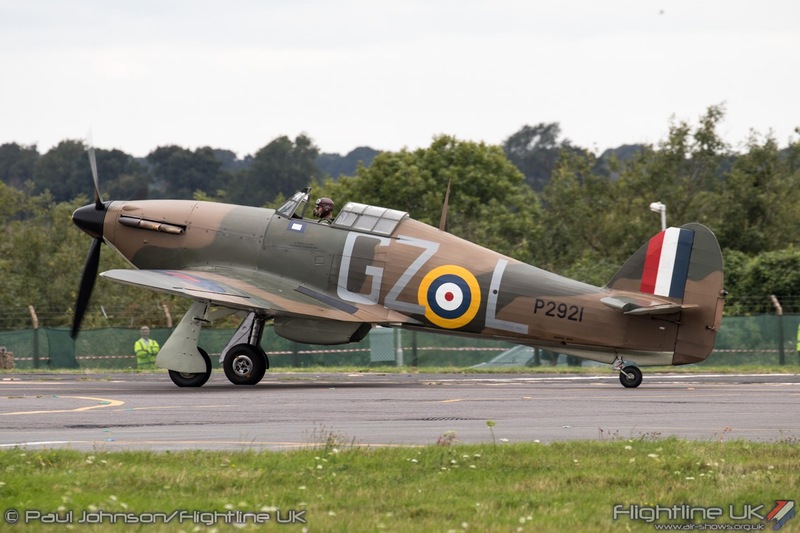 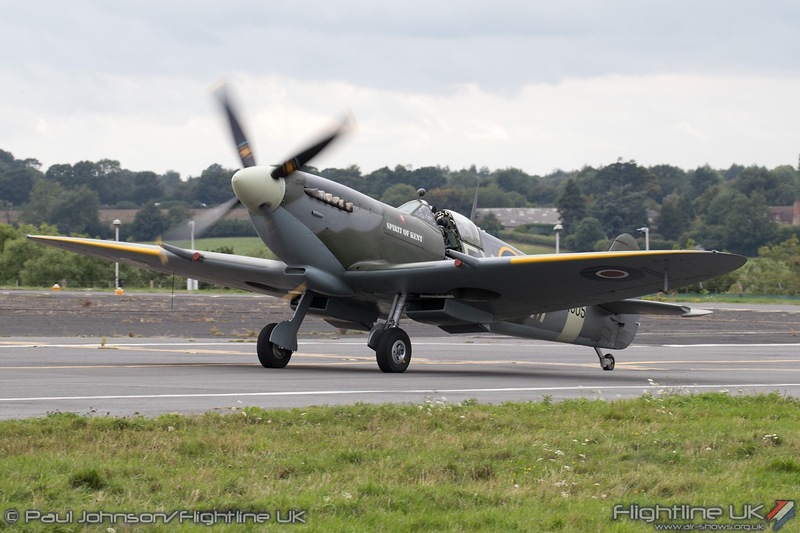 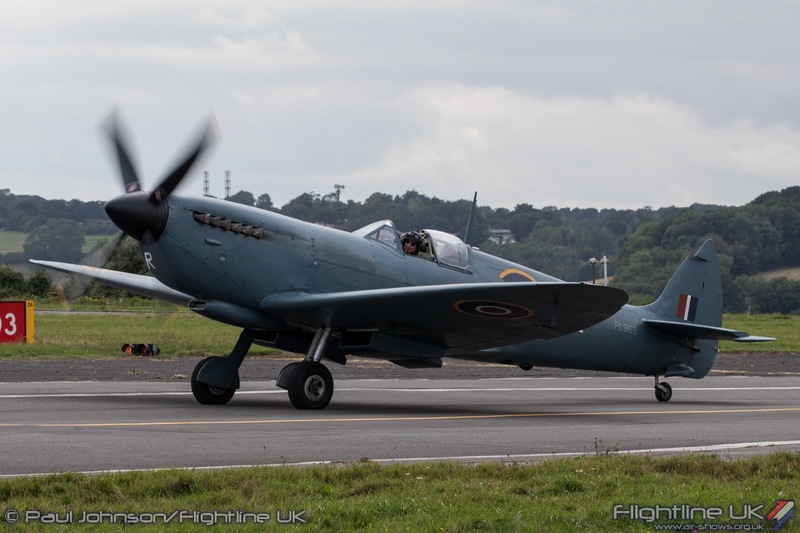 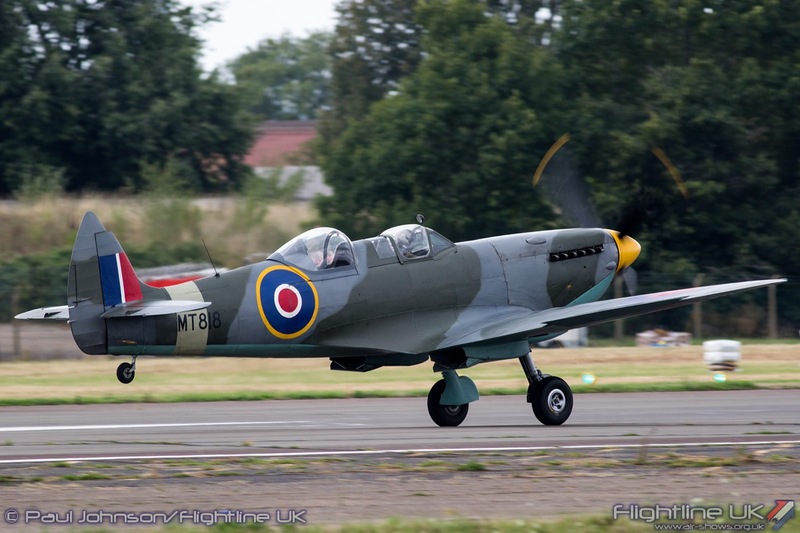 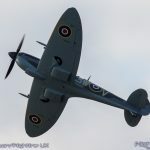 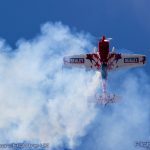 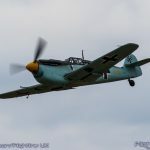 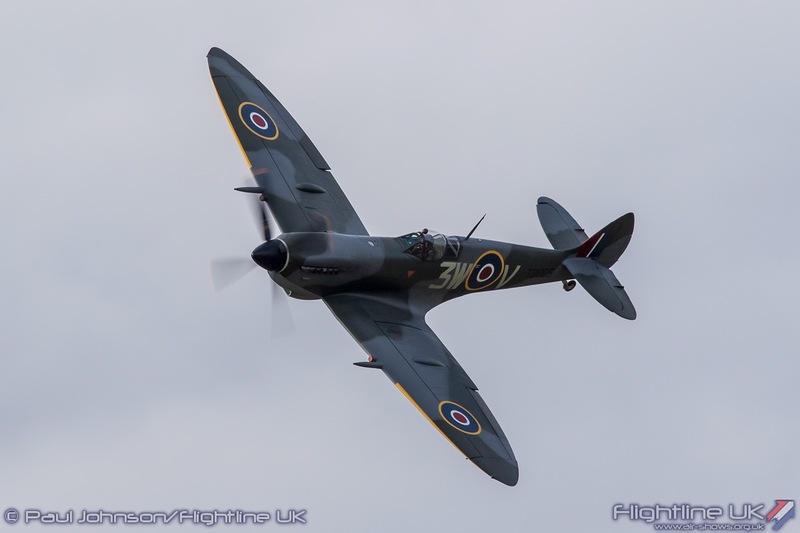 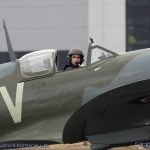 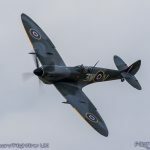 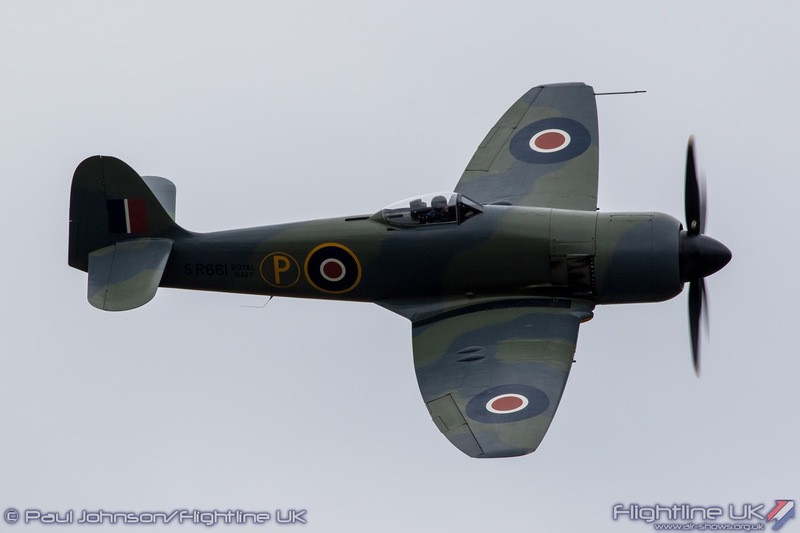 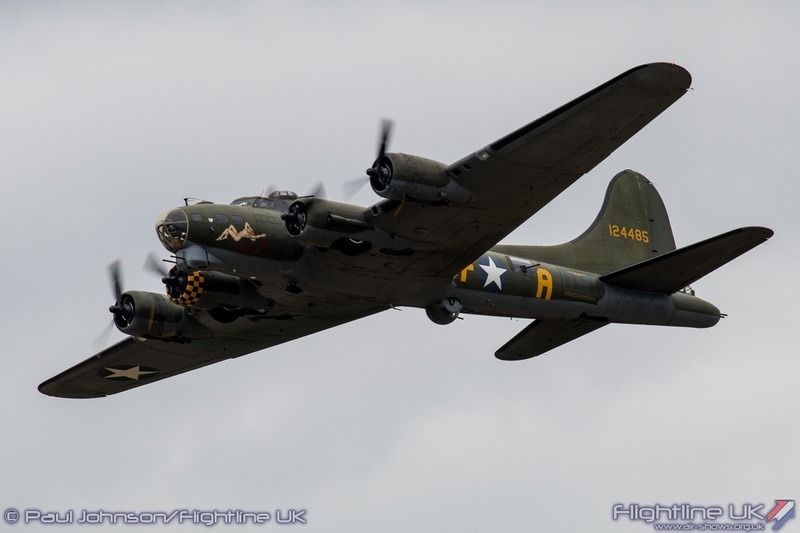 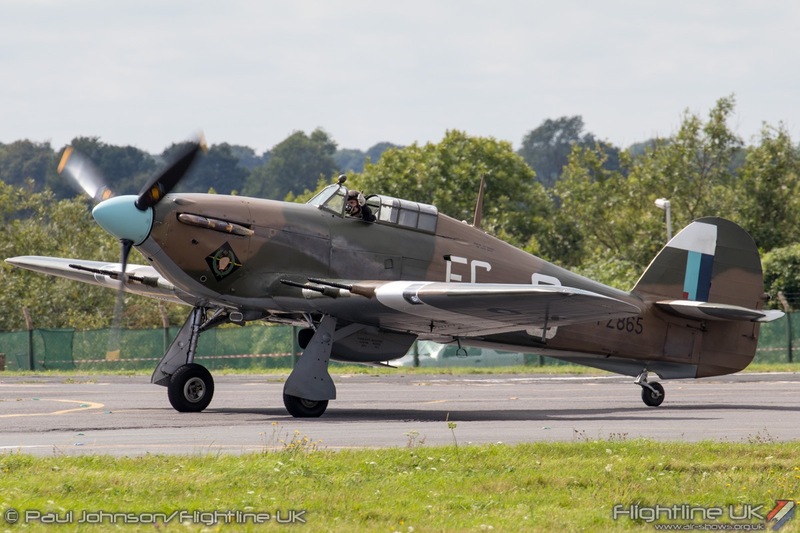 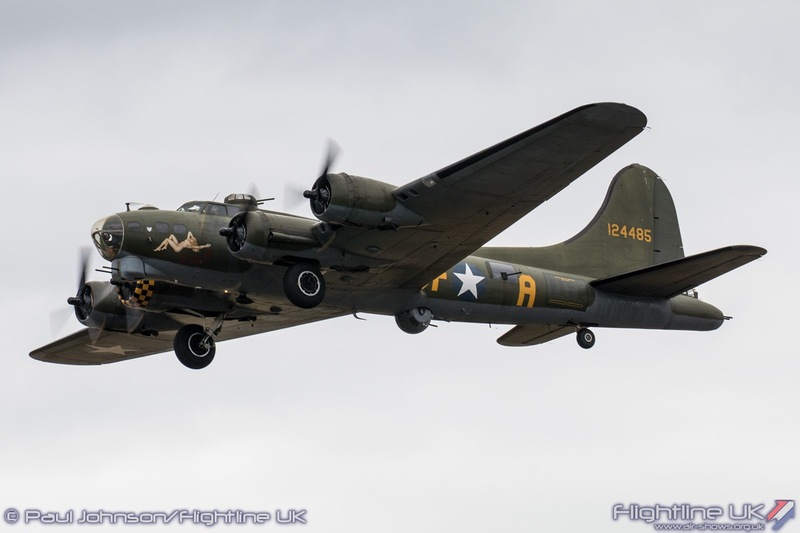 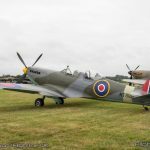 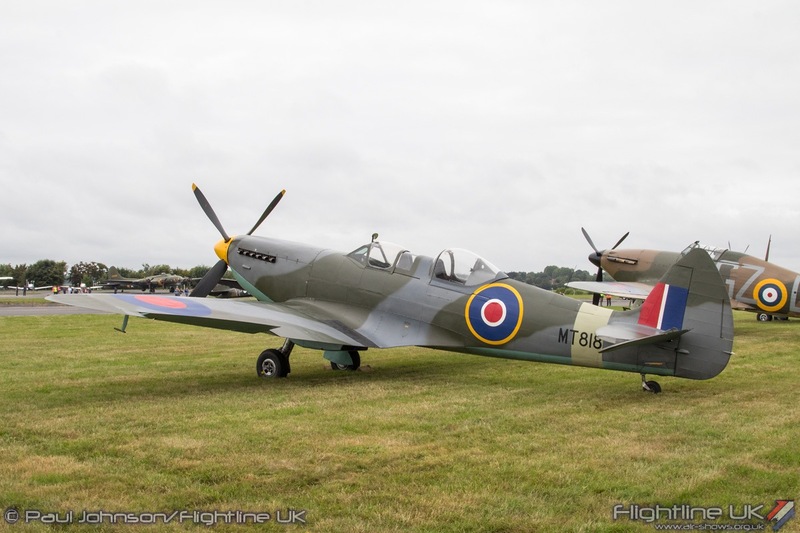 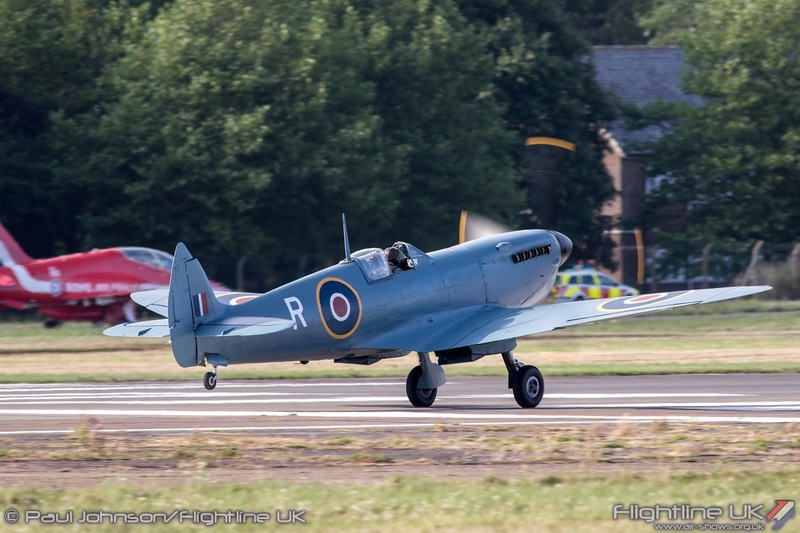 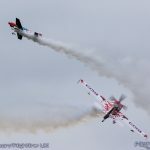 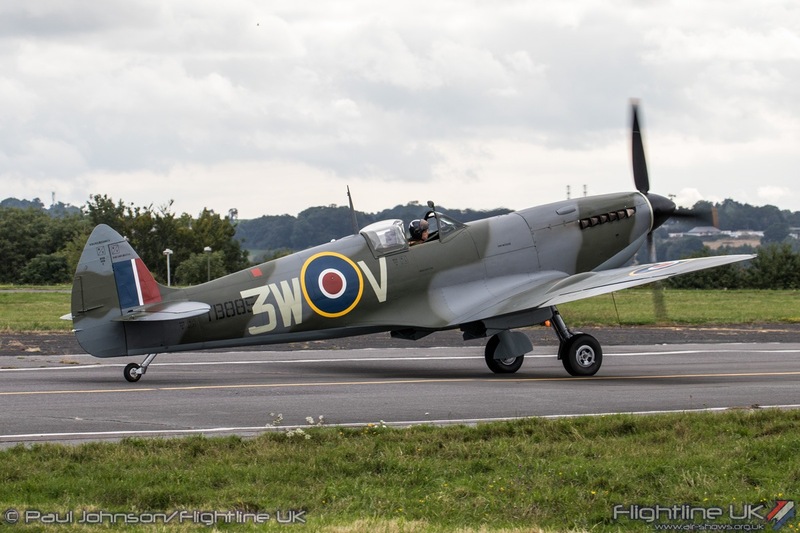 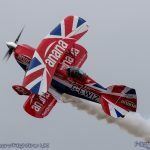 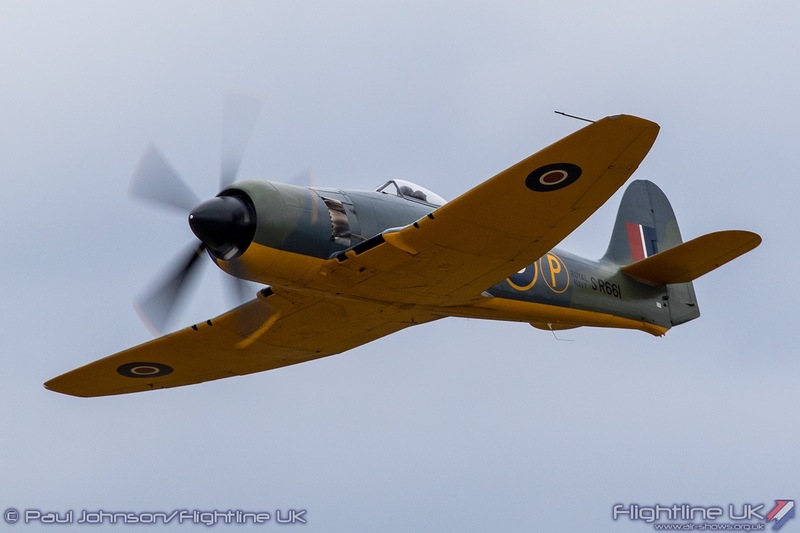 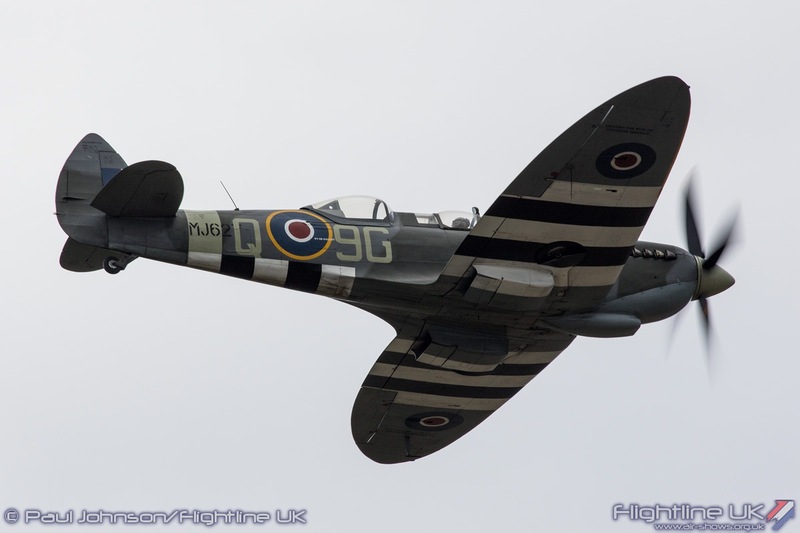 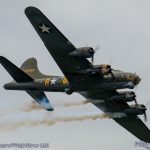 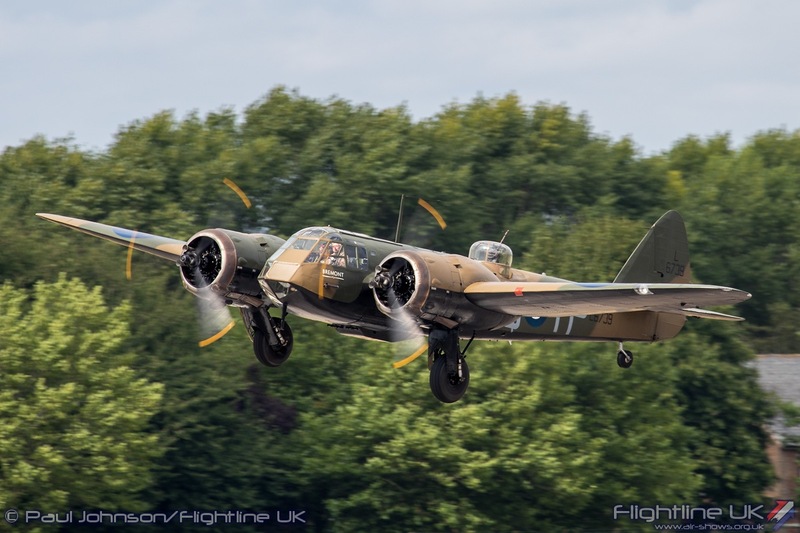 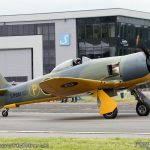 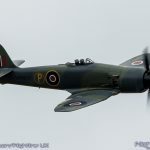 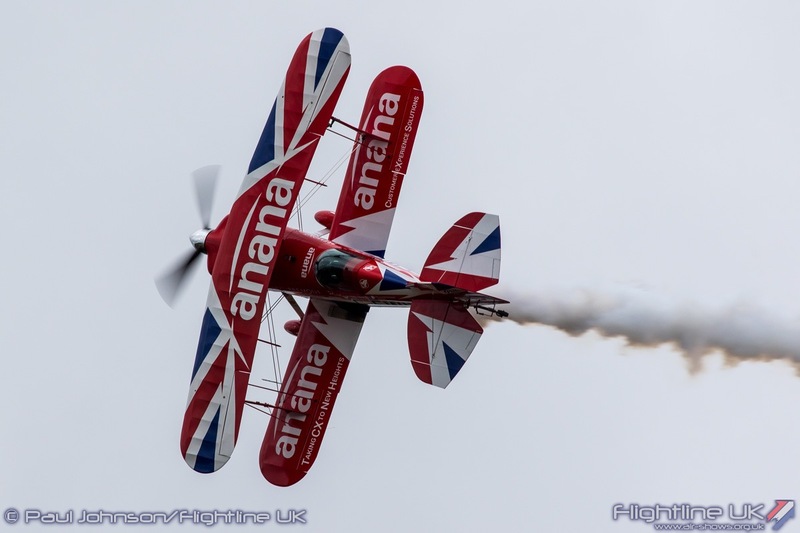 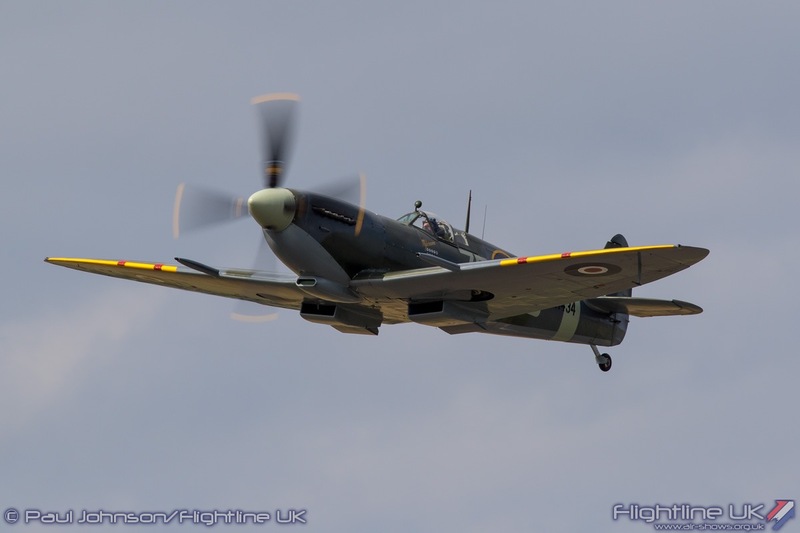 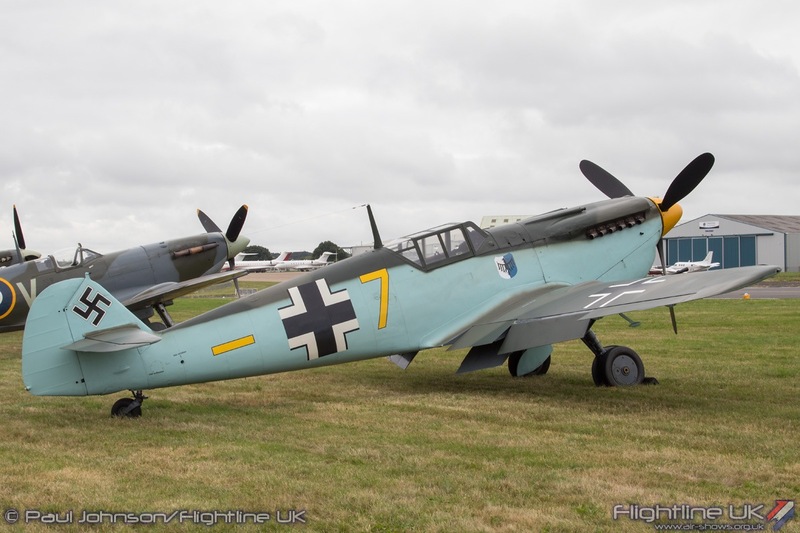 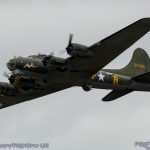 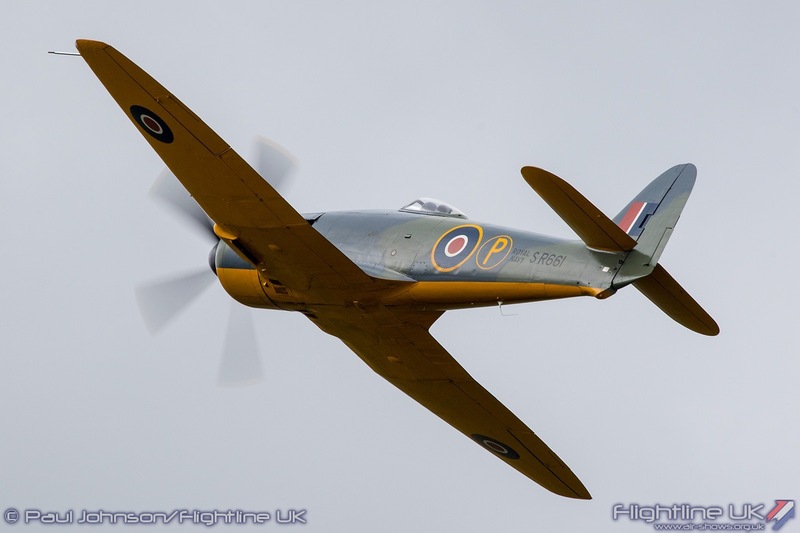 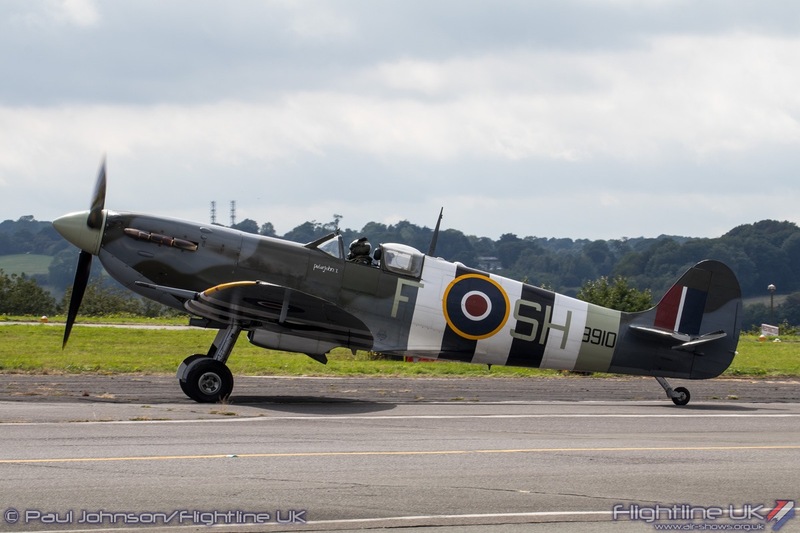 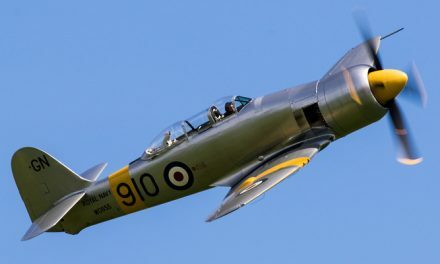 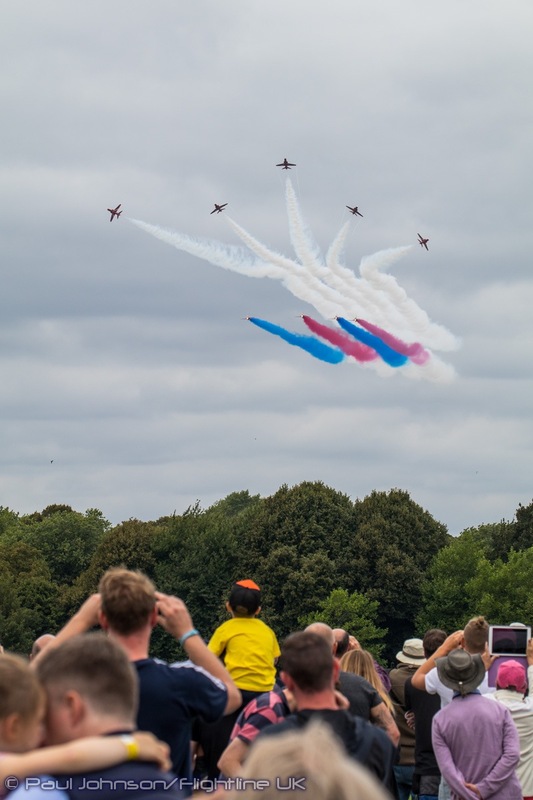 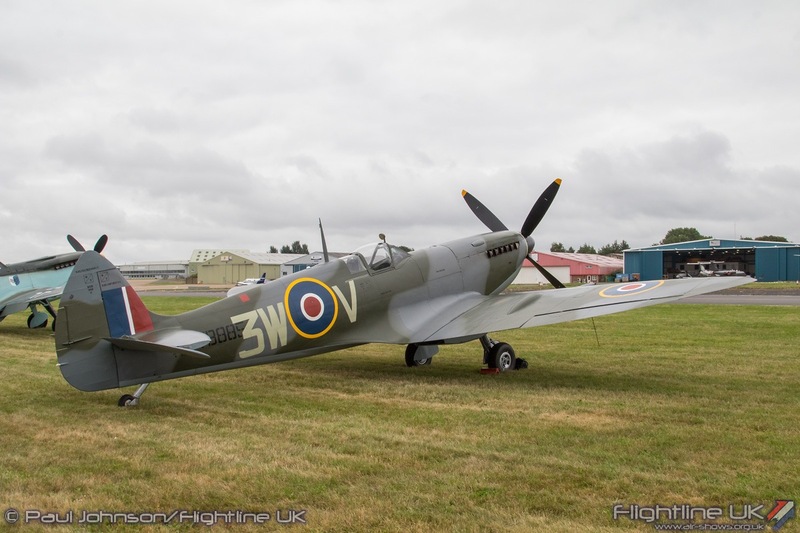 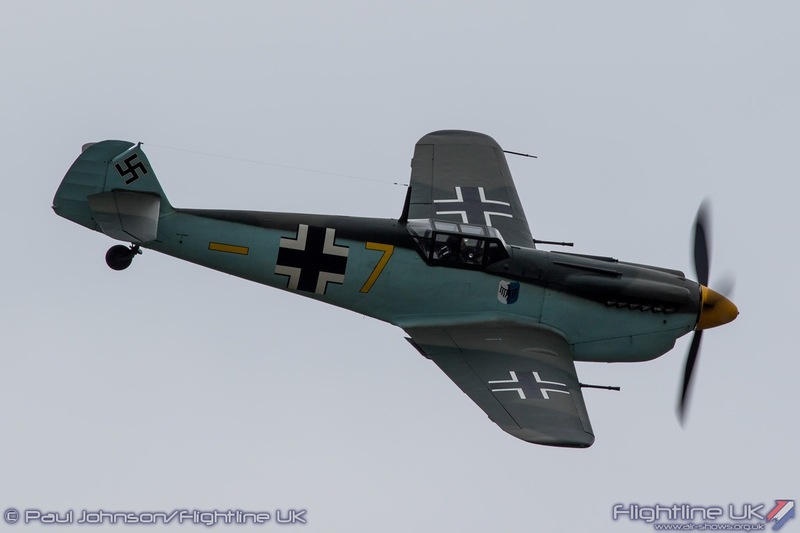 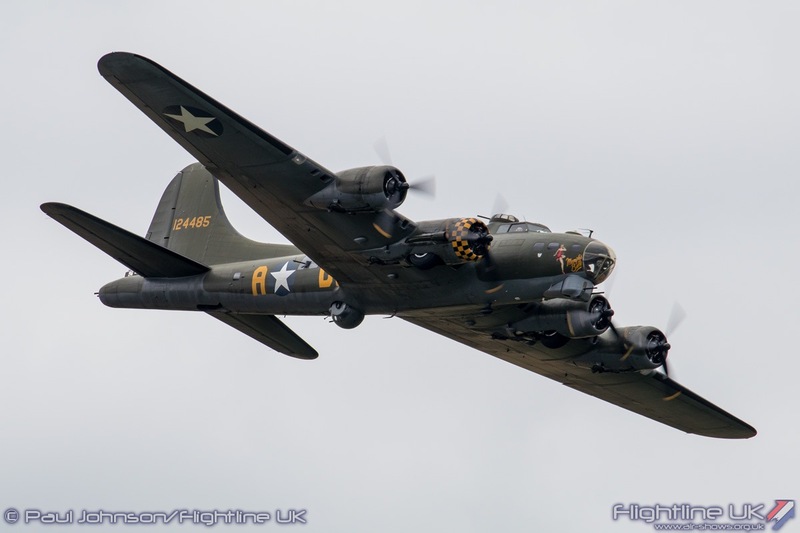 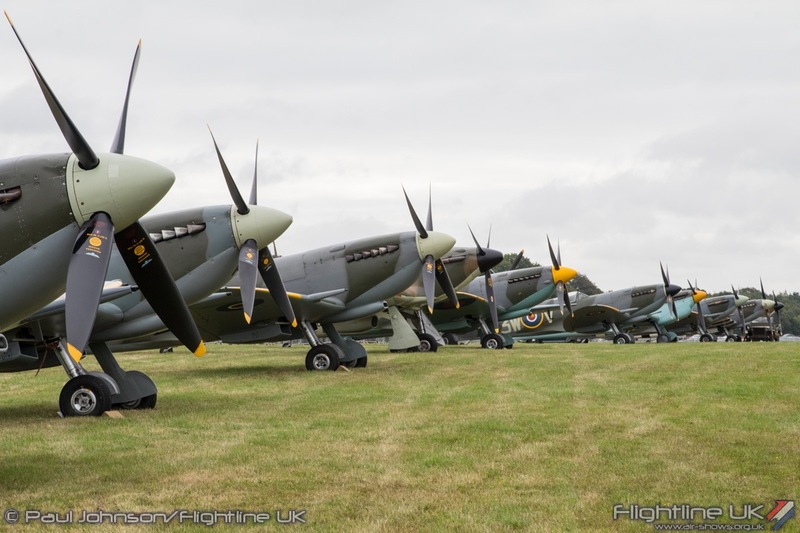 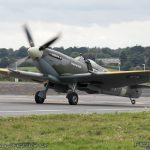 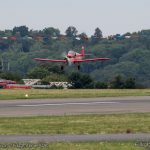 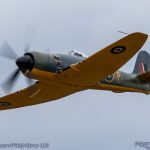 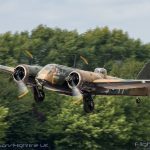 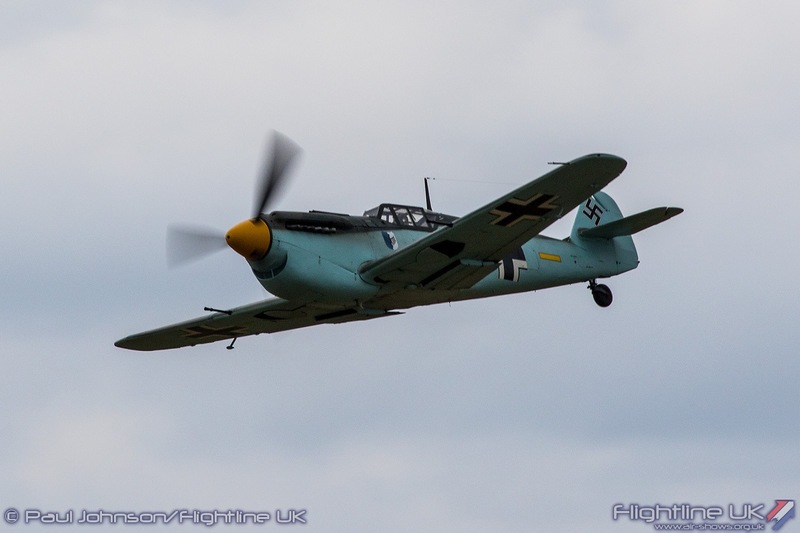 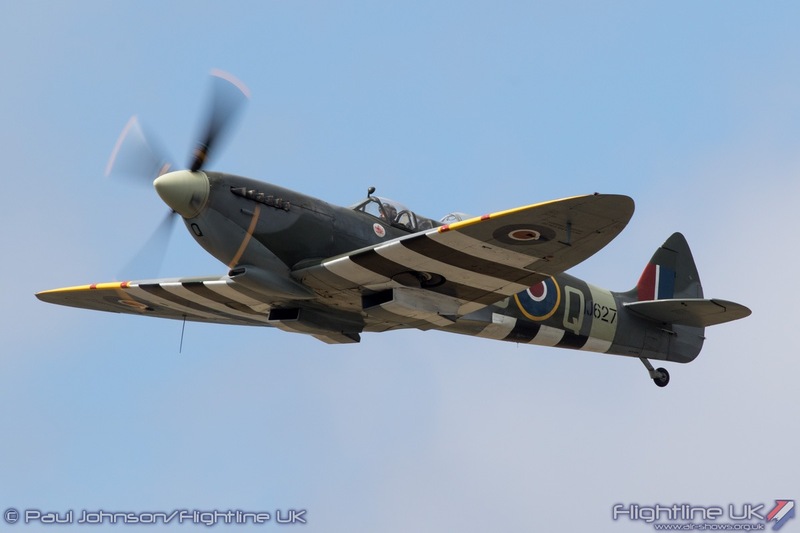 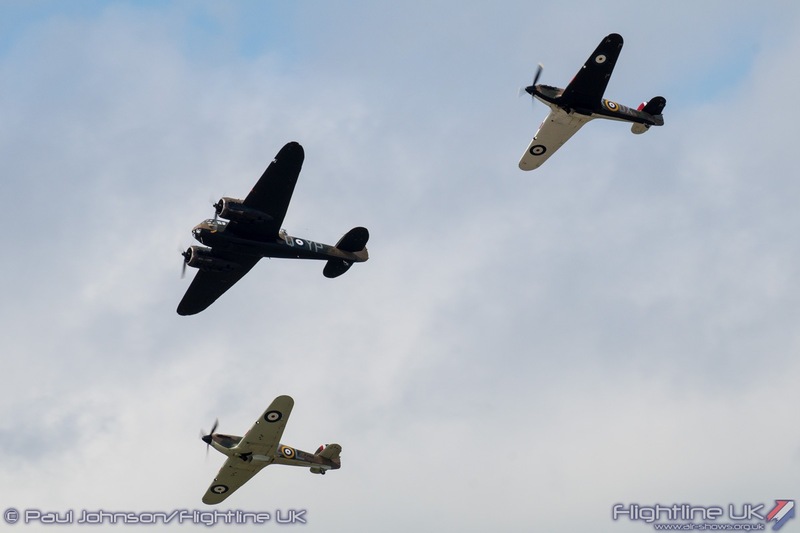 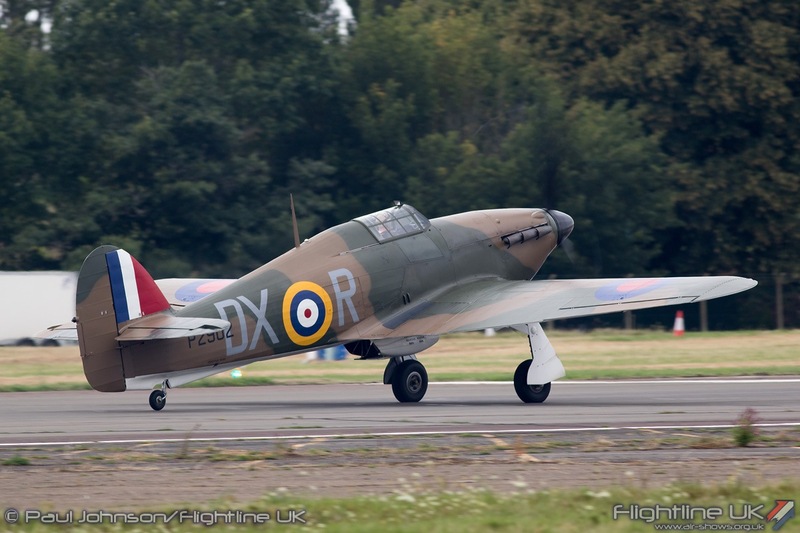 The Biggin Hill Festival of Flight returned in 2018 with a two-day event in the mid-August slot it took up last year. 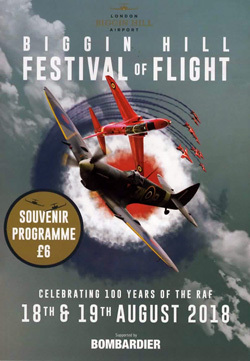 For the RAF Centenary year, the show was centred around a Battle of Britain set-piece marking the Luftwaffe raids of 18thAugust 1940 on RAF airfields in the South East of England. 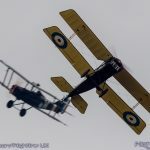 This date subsequently became known as “The Hardest Day” with heavy losses reported on both sides. 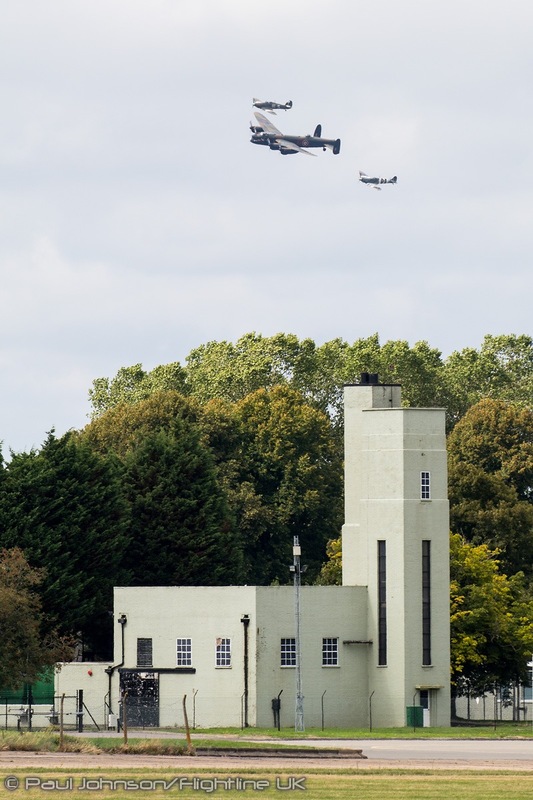 For visitors on the Saturday, this marked 78 years to the day of those the raids. 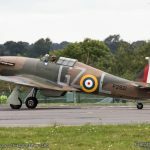 If there is one period that stands out from the last 100 years of the Royal Air Force, it is the Battle of Britain. 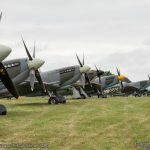 Together with Duxford, Biggin Hill is well placed to host an airshow marking the Royal Air Force’s finest hour defending the skies of the UK and forcing Hitler to postpone indefinitely his invasion plans. 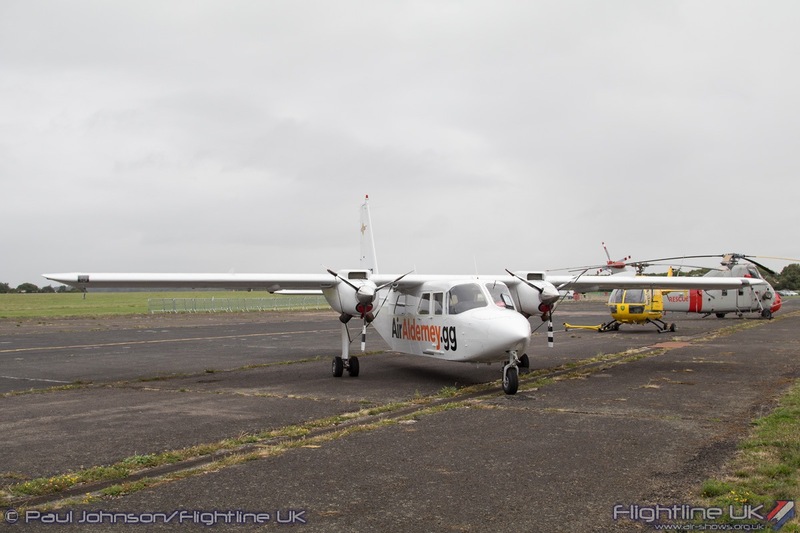 Today the airfield is now a thriving business and general aviation airport which provides a vital link to the City of London. 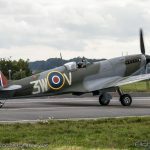 However, the airport operators are acutely aware of the heritage of the site and often play host to events celebrating the history of the Kent airfield and the wider Royal Air Force. 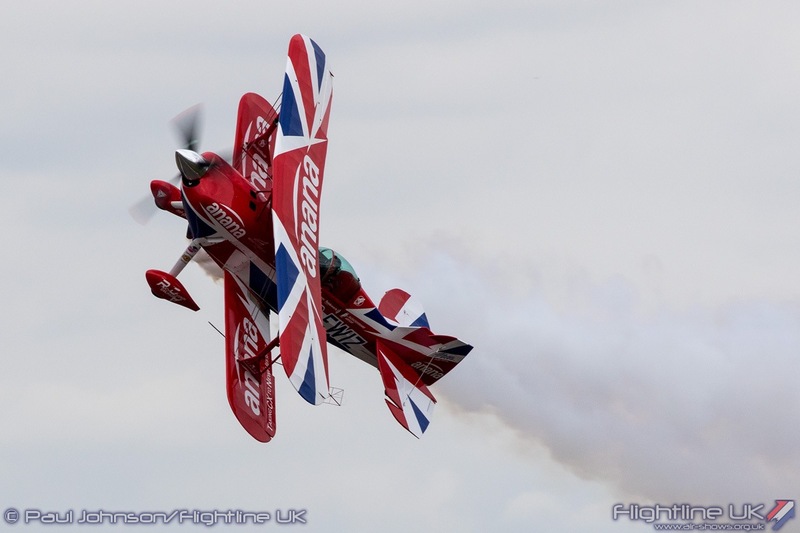 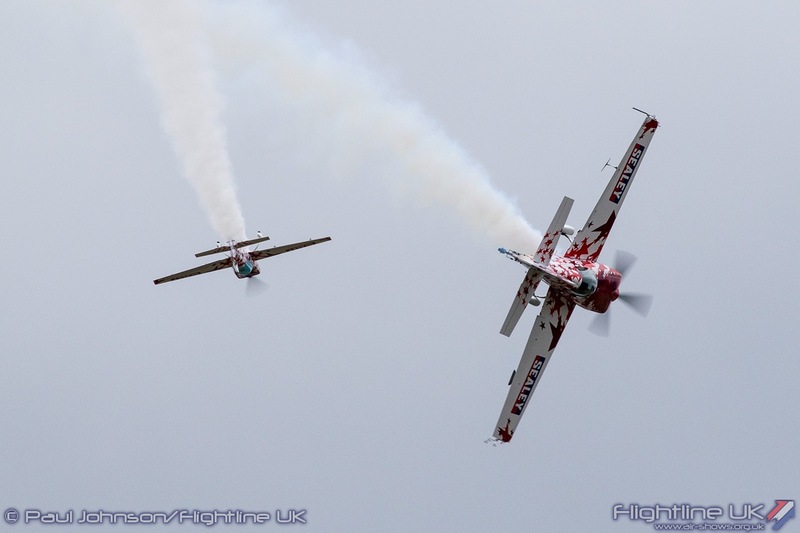 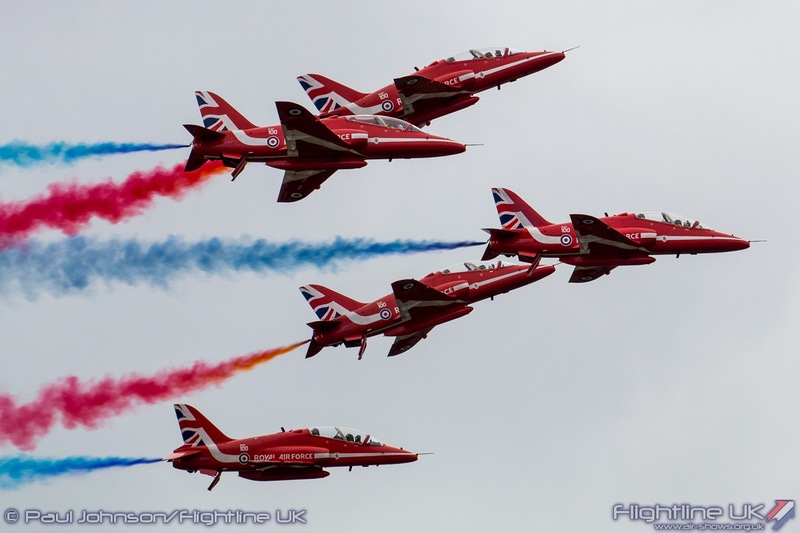 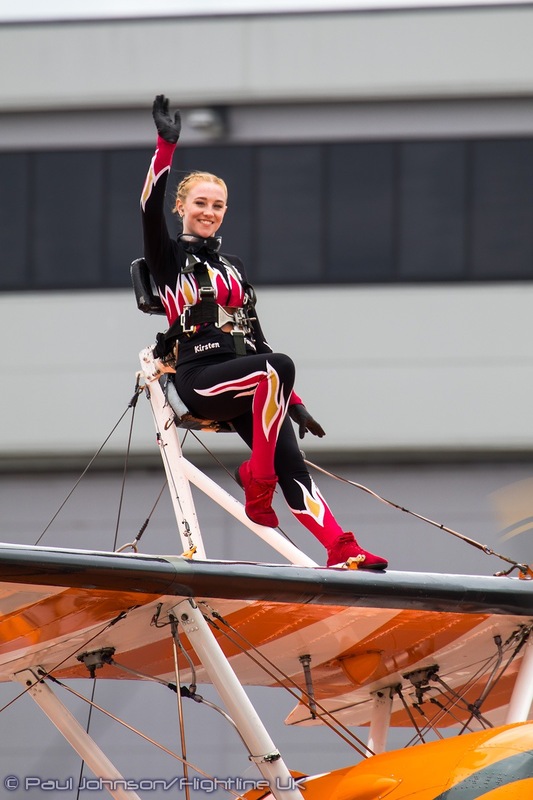 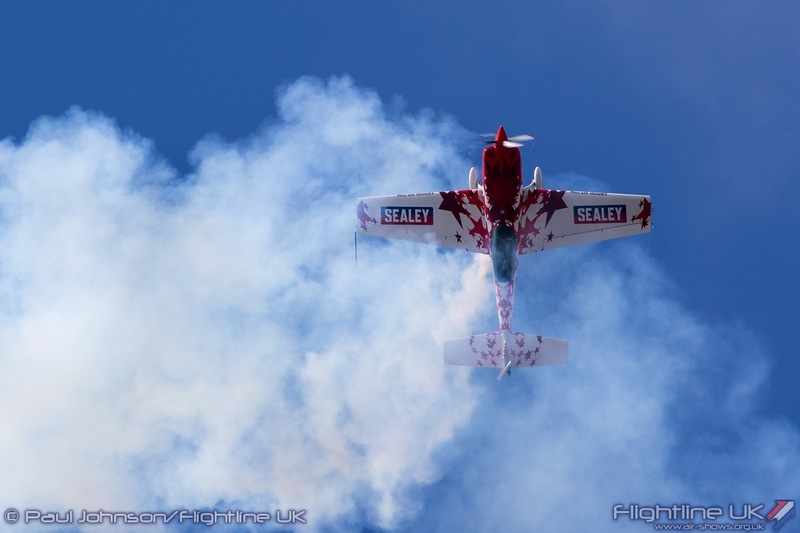 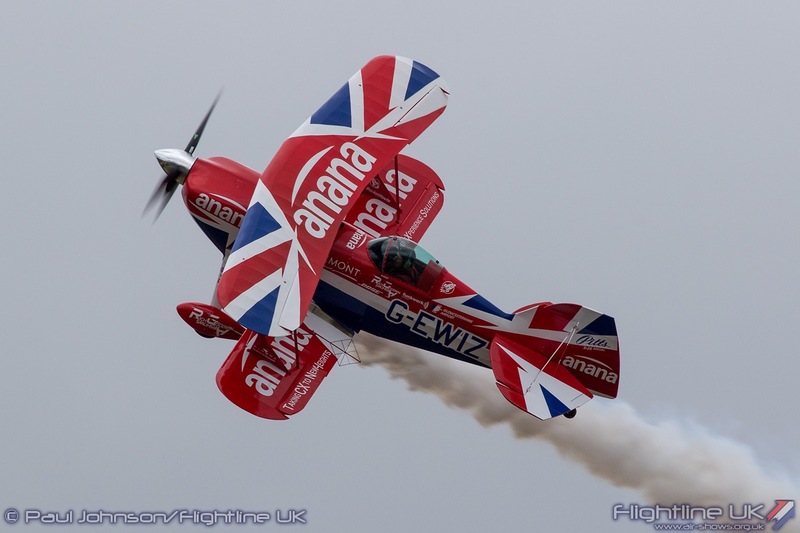 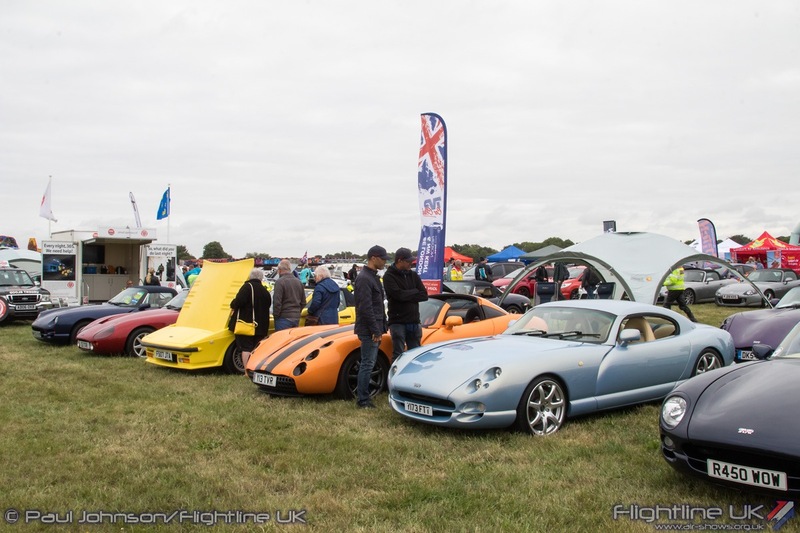 The Festival of Flight was first held in 2014 and is an event focussed on the local Biggin Hill community. 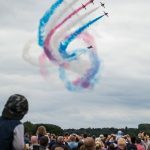 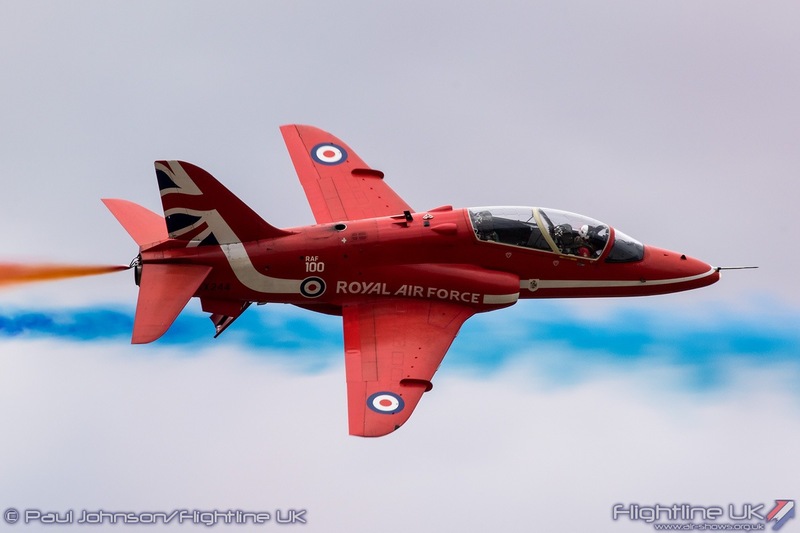 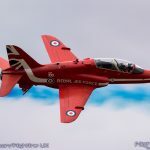 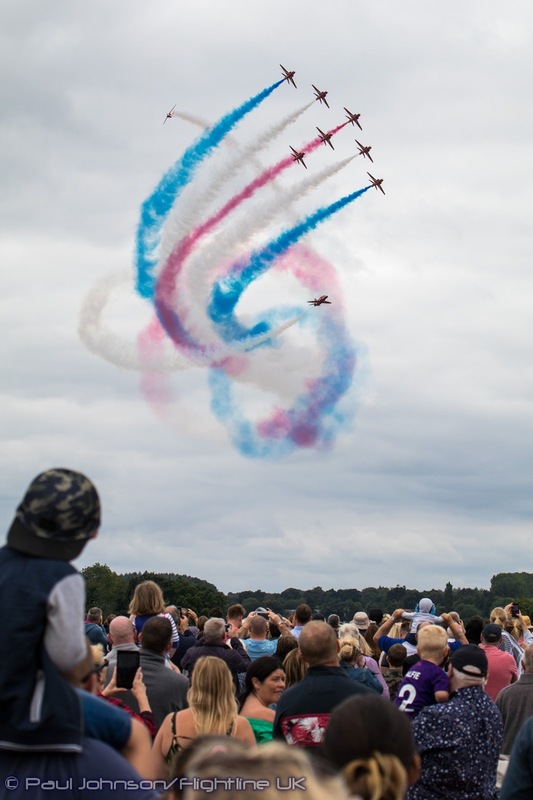 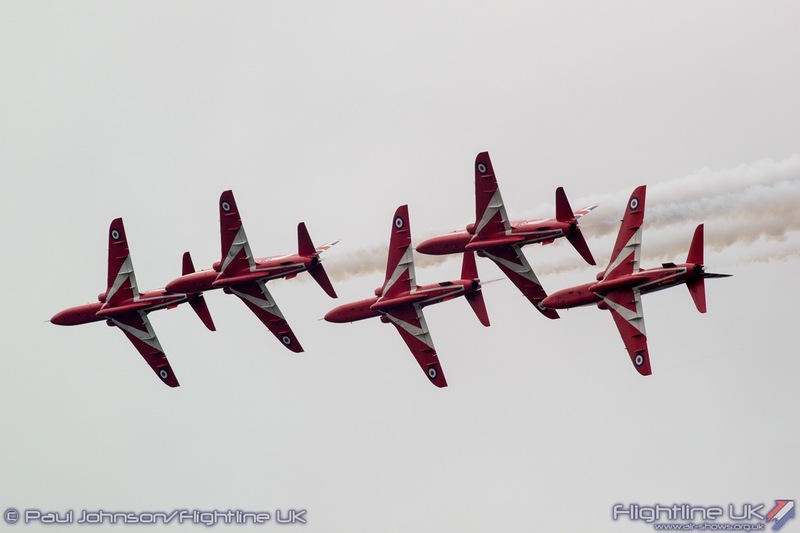 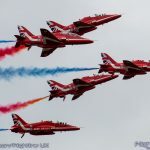 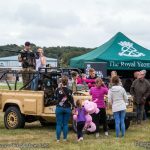 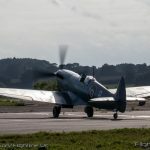 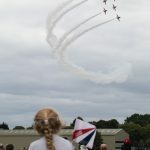 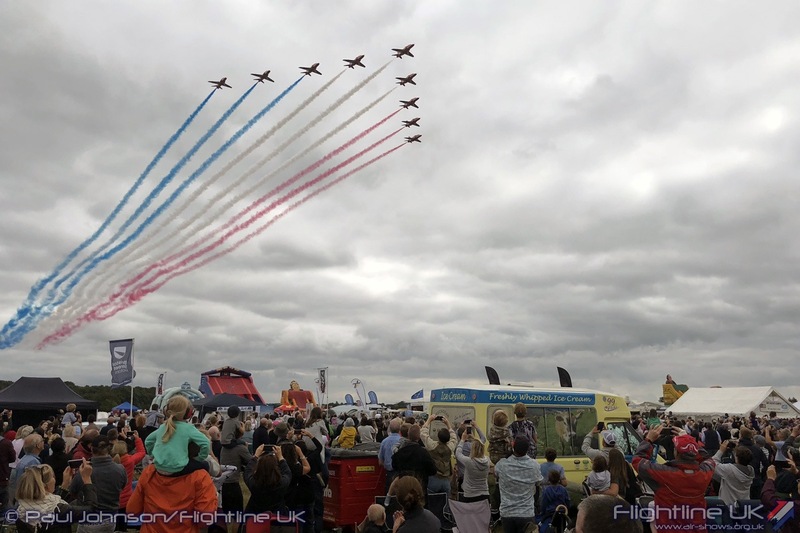 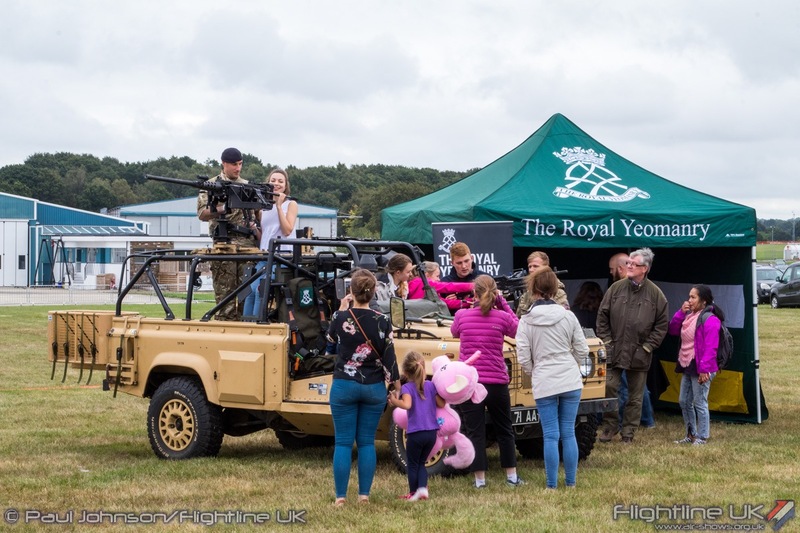 It has however marked some significant anniversaries since the inaugural event including the 50th Anniversary of the Red Arrows in 2014, the 75th Anniversary of the Battle of Britain at the 2015 Festival and in 2017, the 100th Anniversary of the airfield itself. 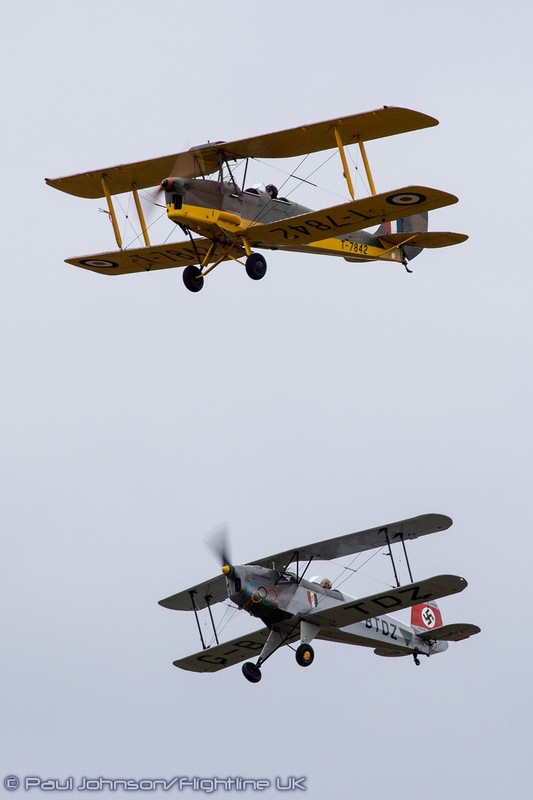 Whereas previous events had been single day events, due to the significance of the airfield centenary the 2017 festival was expanded to a two-day event. 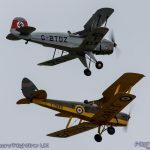 The airfield centenary also attracted a number of international military displays from the Belgium, the Czech Republic and France which all share strong ties with the airfield. 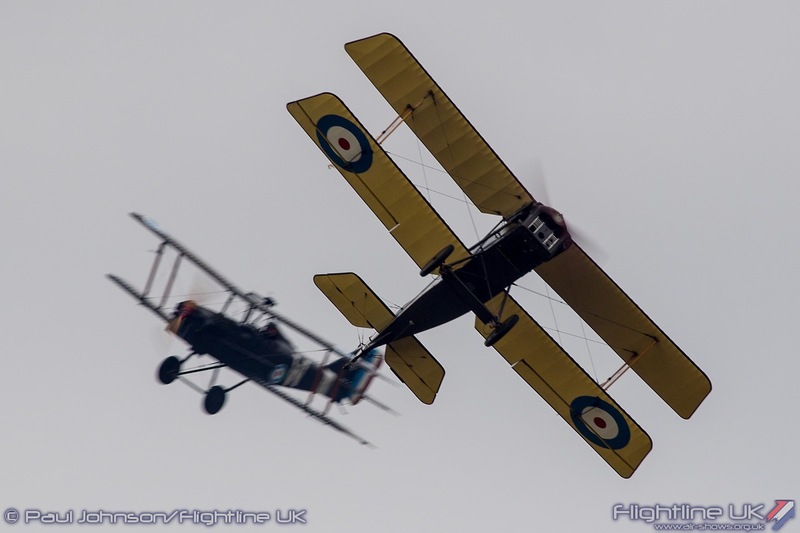 That however was very much a one-off event for a very special occasion. 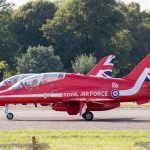 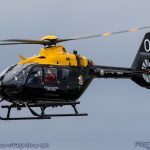 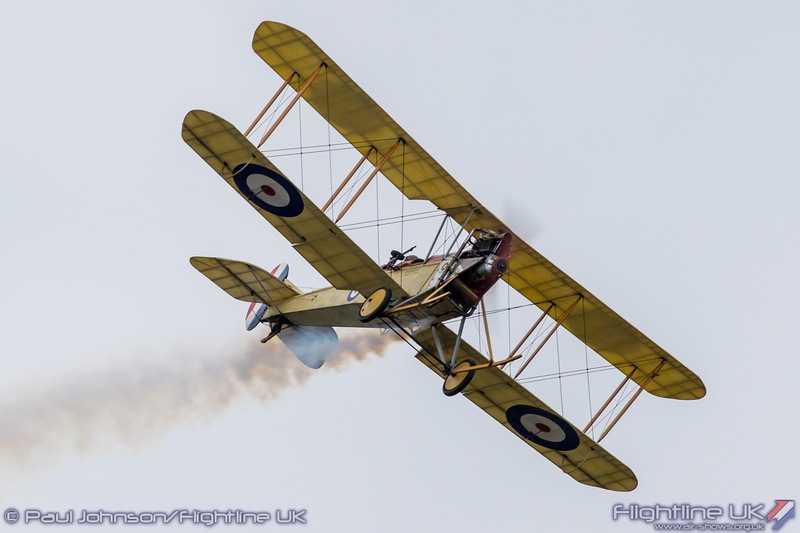 2018 saw the Festival of Flight mark the 100th Anniversary of the Royal Air Force both in the air and on the ground. 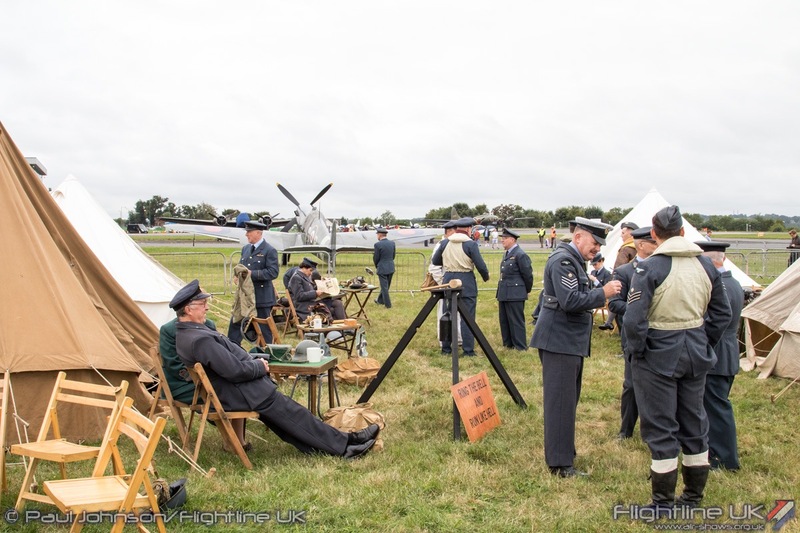 A themed marquee contained a number of displays marking several significant periods with the RAF’s history with various artefacts and even live music. 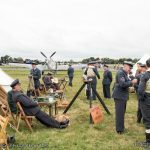 Elsewhere, the showground contained all the usual traders plus displays from military units closely associated with the airfield and London. 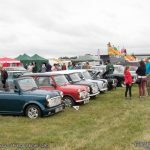 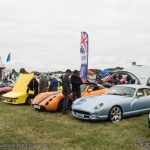 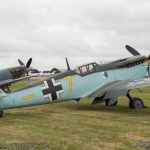 New for 2018 was the Biggin Hill Car Show with all sorts of motors on display. 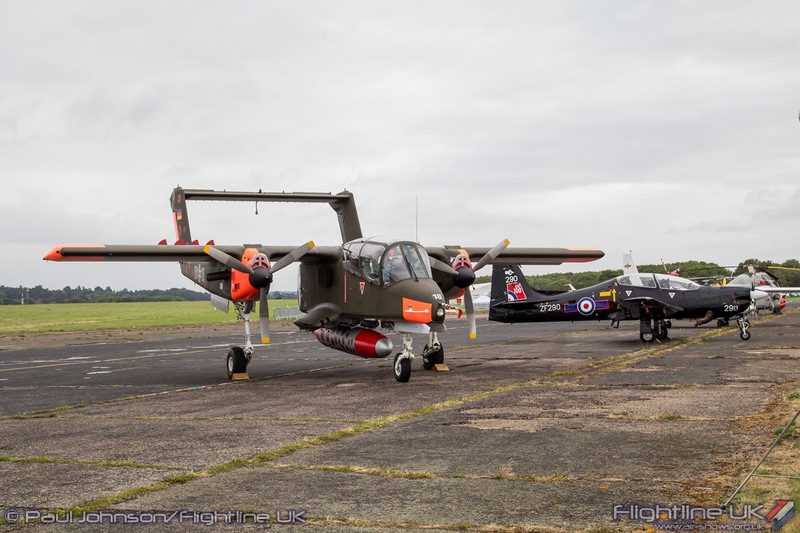 There was also the usual small static display of aircraft with includes a Westland Wessex, MBB Bo-105, Britten-Norman Islander, Bell 206 Jetranger and a sole Shorts Tucano T1 from the Royal Air Force wearing its RAF100 livery. 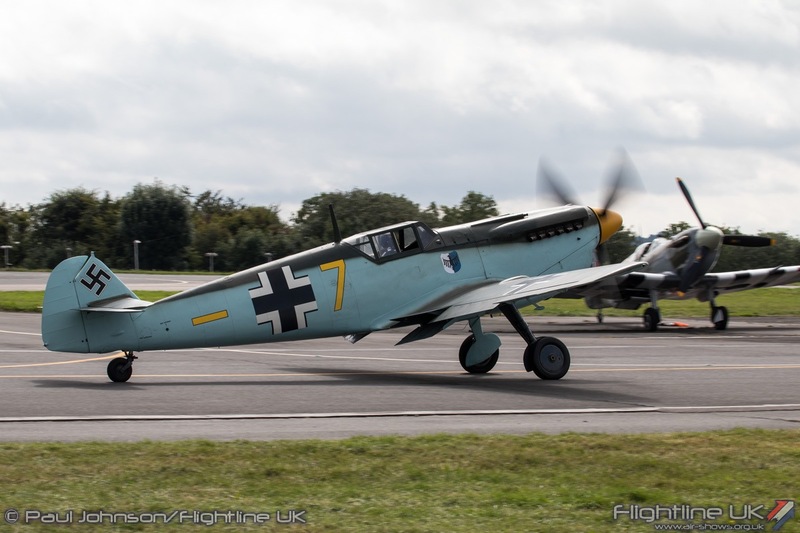 Biggin Hill flying displays are always varied affairs mixing old and new from both civilian and military operators. 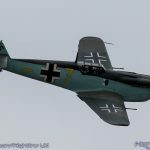 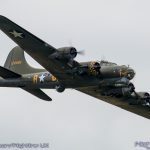 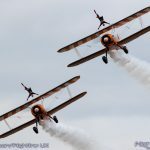 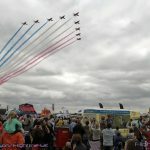 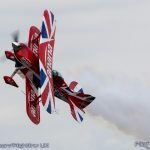 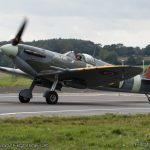 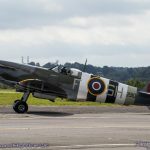 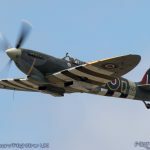 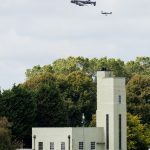 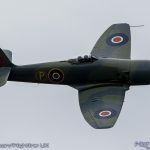 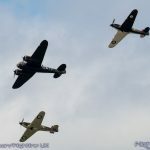 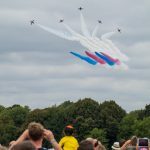 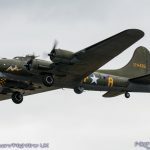 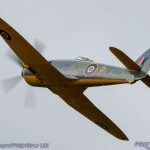 With a glut of 100th Anniversary events across Europe, the international military participation proved hard to attract so the RAF100 flying display was built around a very impressive Battle of Britain set-piece featuring the largest number of warbirds gathered at a Biggin Hill airshow for a number of years. 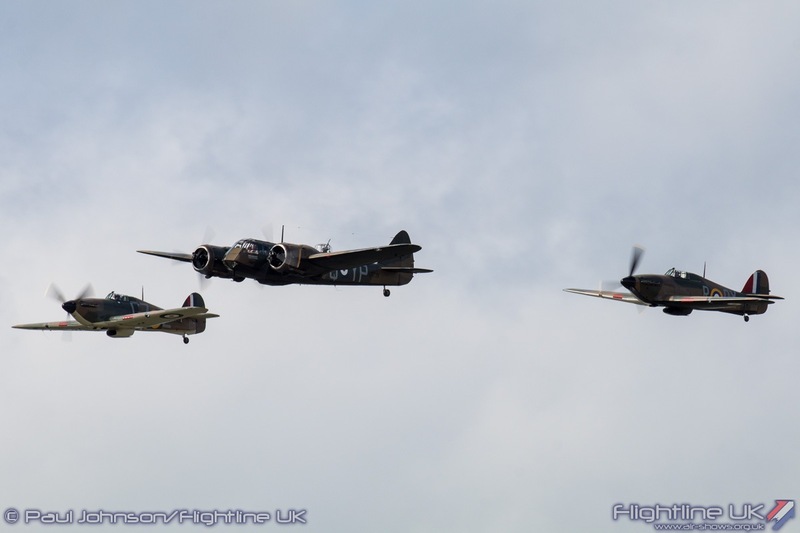 The flying display was not just about warbirds, with a variety of military and civilian displays joining the action. 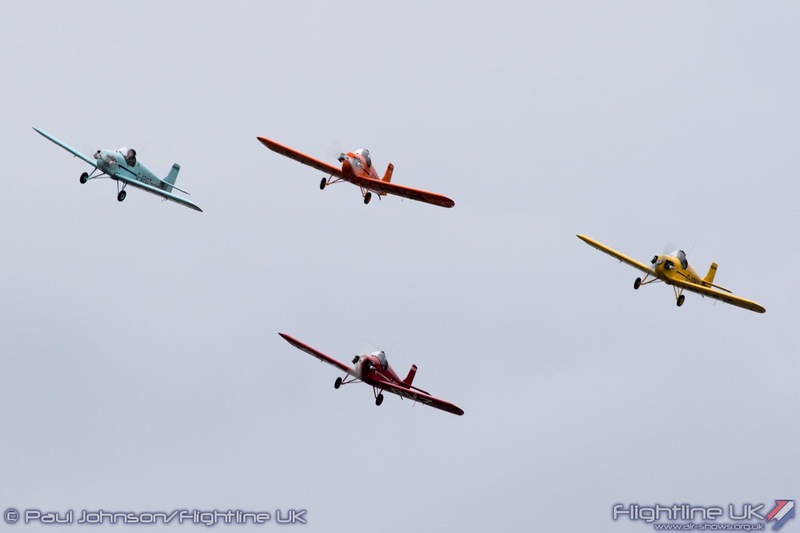 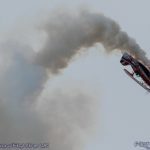 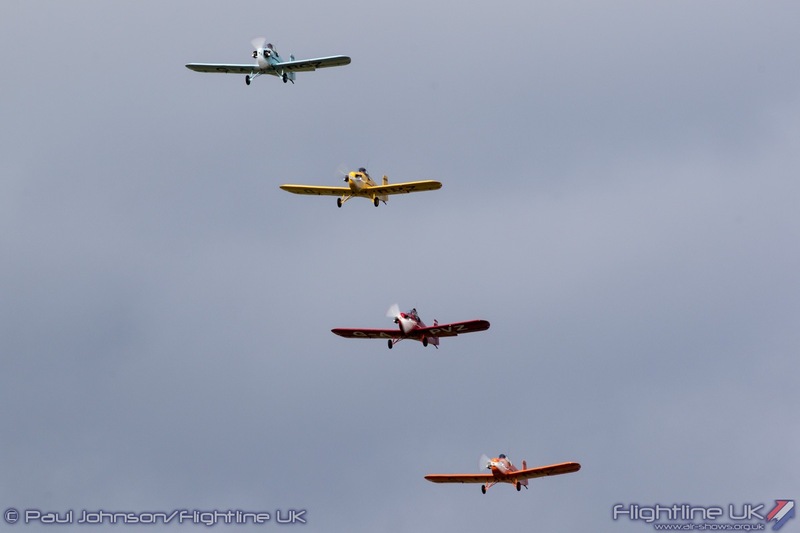 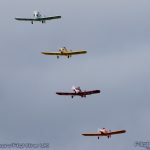 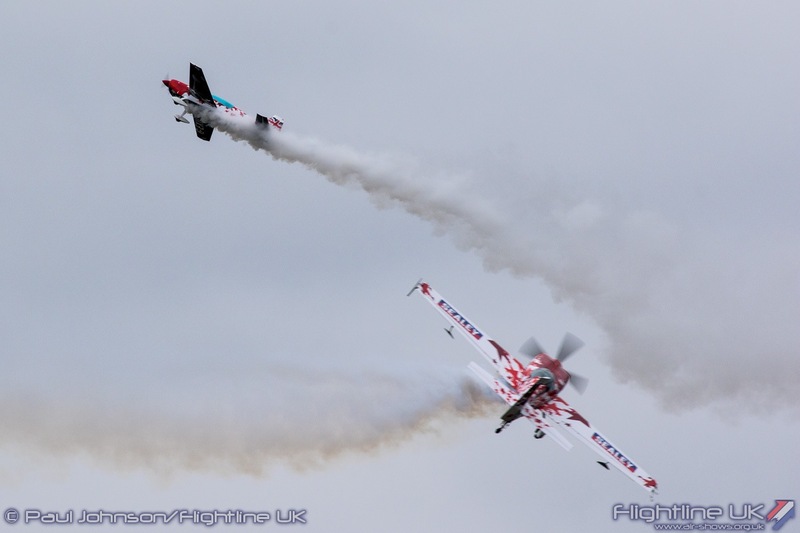 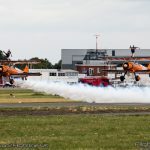 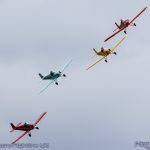 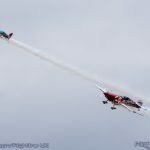 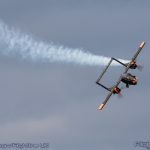 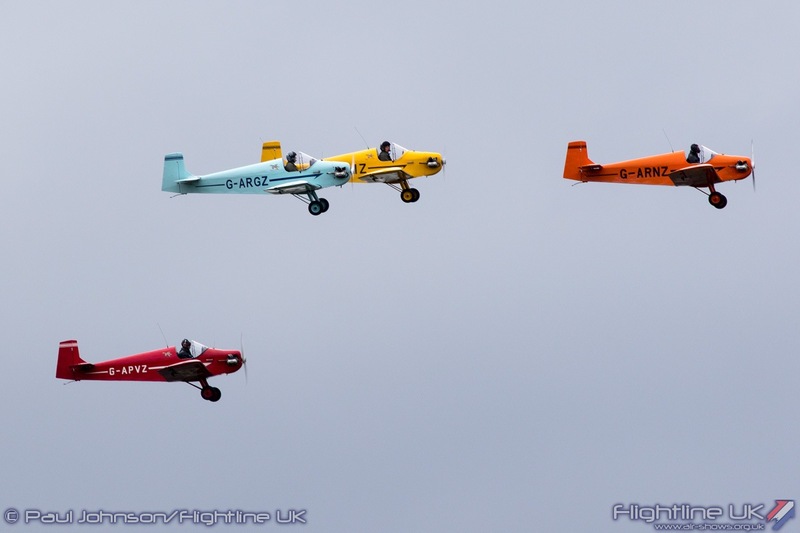 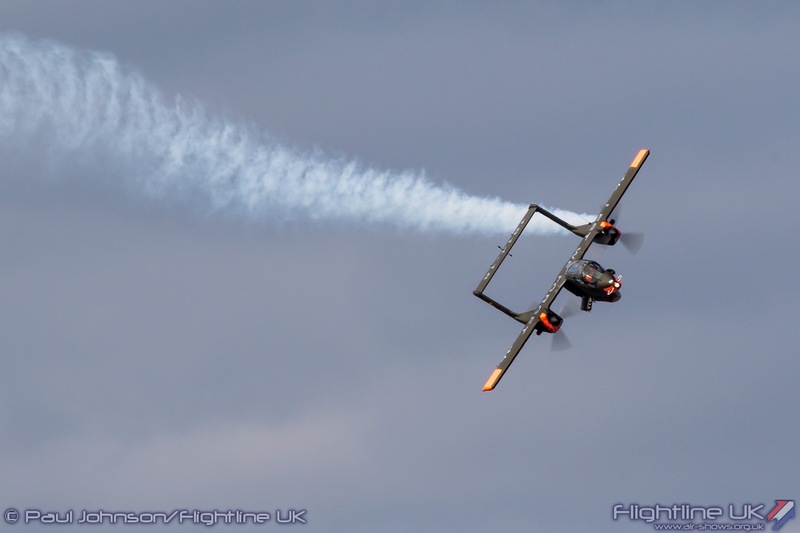 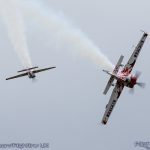 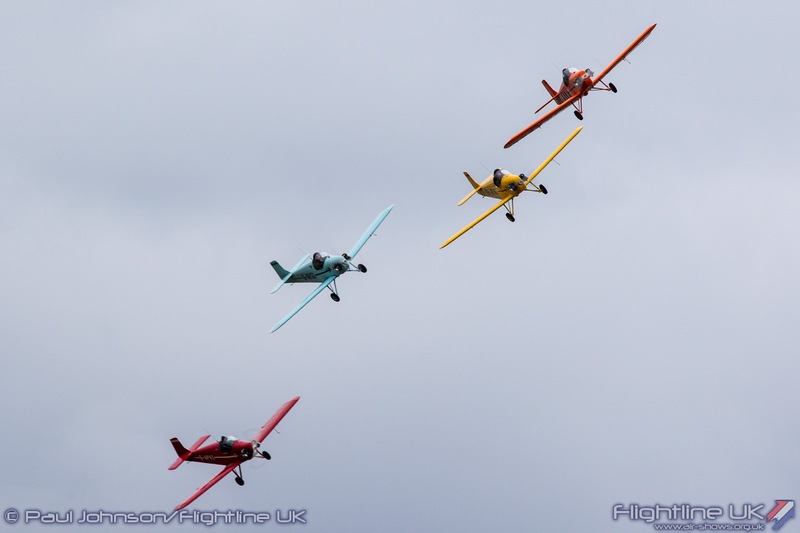 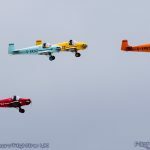 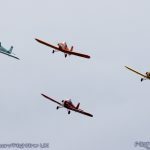 The smallest aircraft in the show came from a relatively local team, the Tiger Club’s Turbulent Display Team flying four diminutive Druine D31 Turbulents. 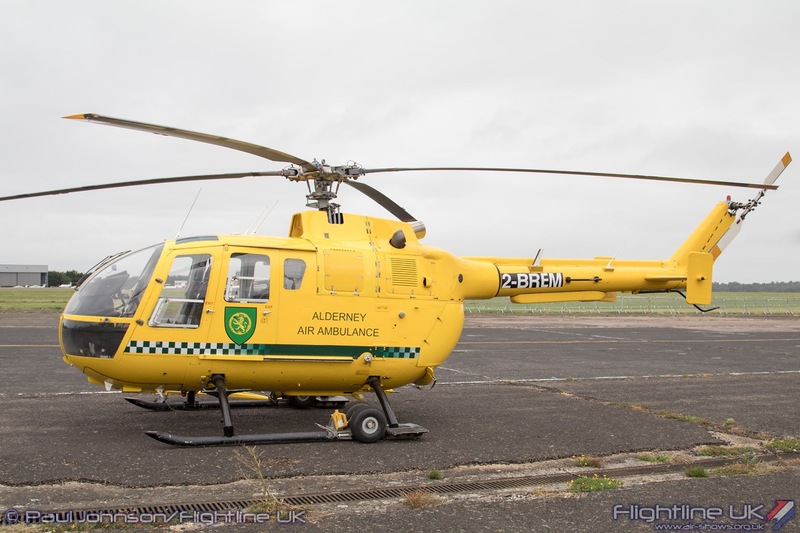 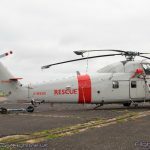 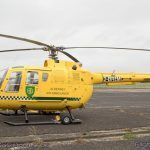 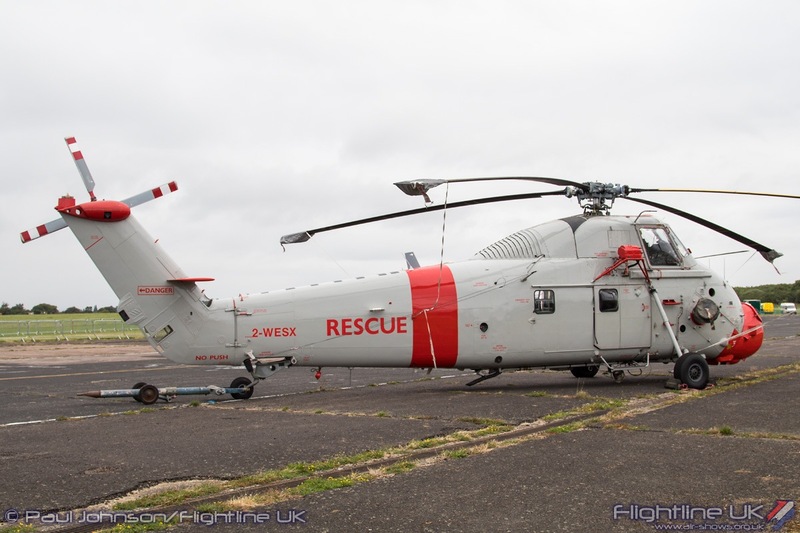 The team have a long association with the area around Biggin Hill having been based at Redhill, Headcorn before moving to their current base at Damyns Hall. 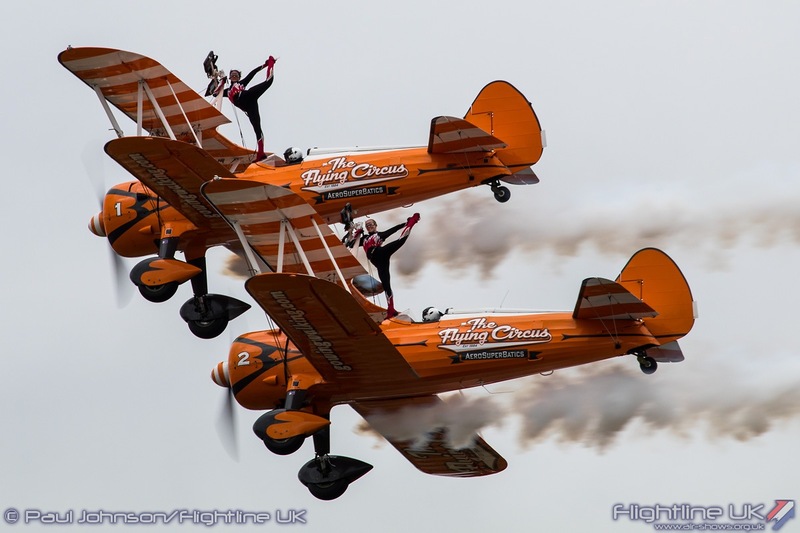 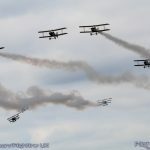 The team perform many of the classics of flying circus with flour bombing and limbo flying being part of the repertoire demonstrated in their Biggin display. 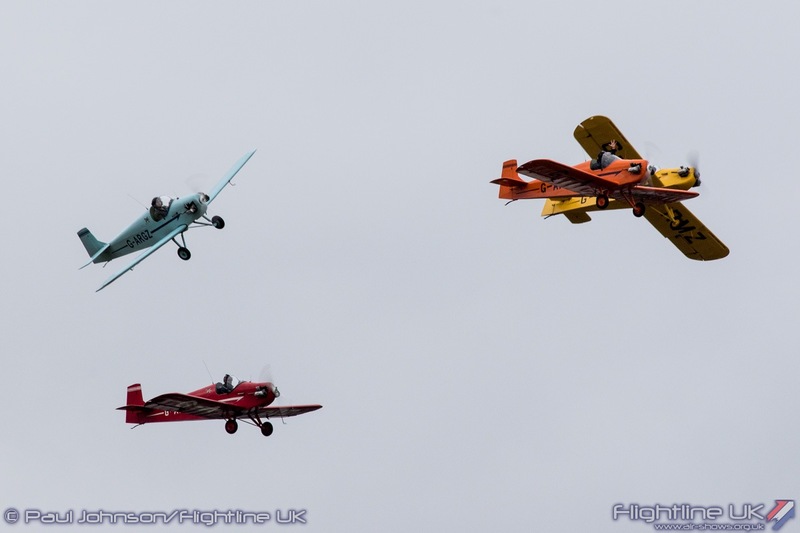 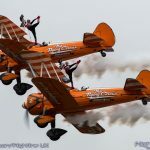 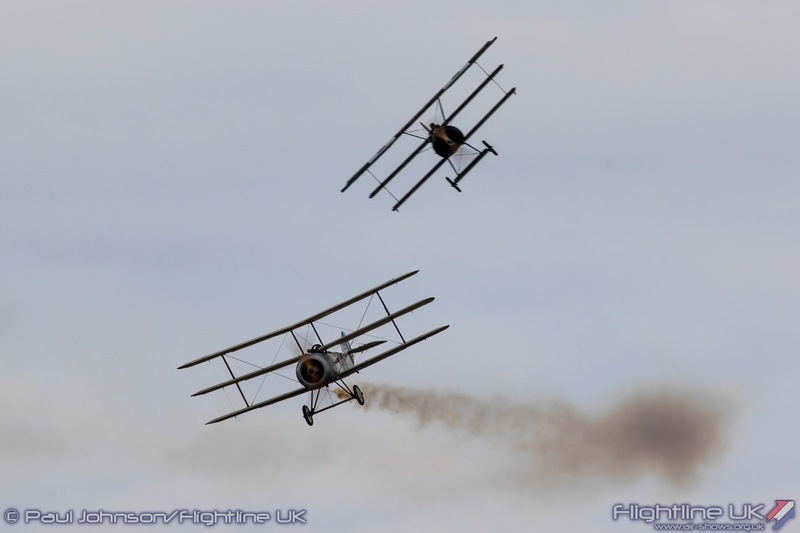 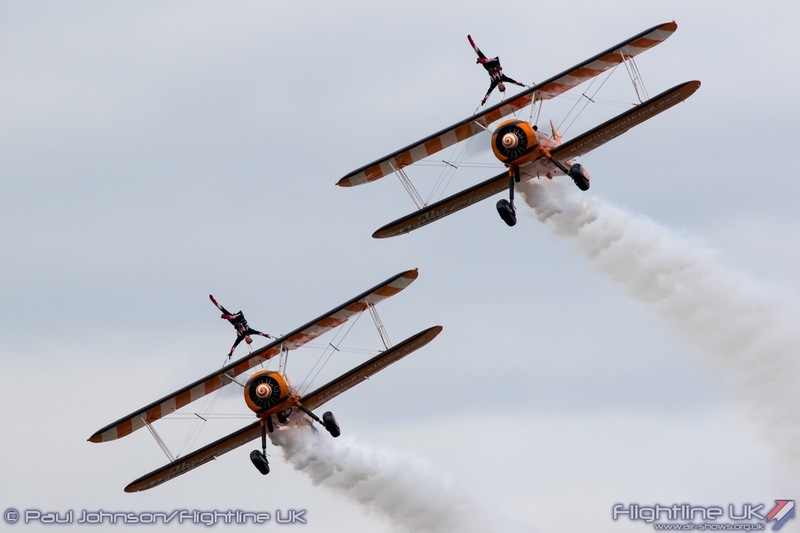 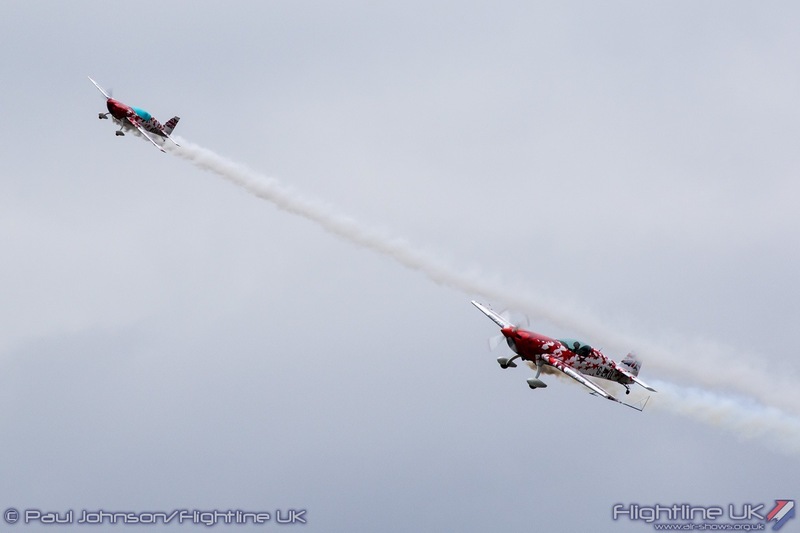 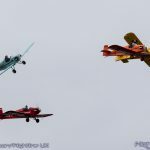 More aerial antics came courtesy of the Aerosuperbatics Wingwalkers with their two Boeing Stearmans plus the amazing Extra “Little and Large” Duo which pairs Chris Burkett in a full sized Extra 300S with a 40% scale model flown by Champion R/C pilot Mike Williams. 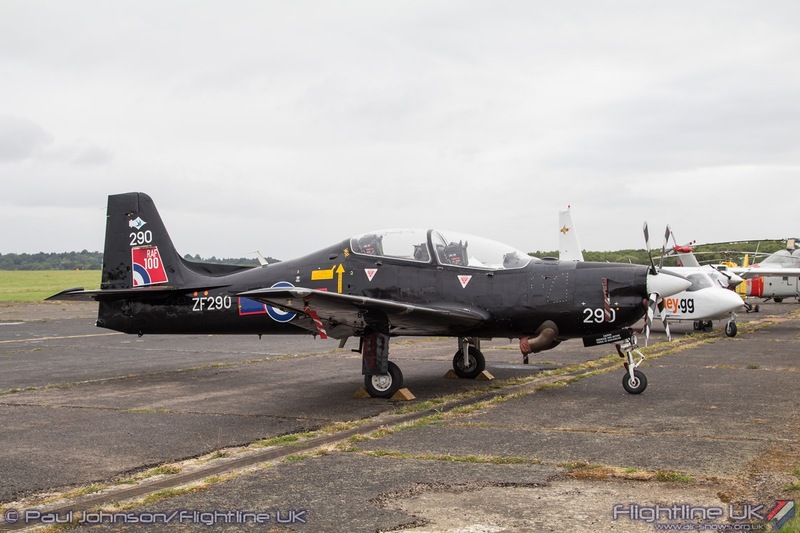 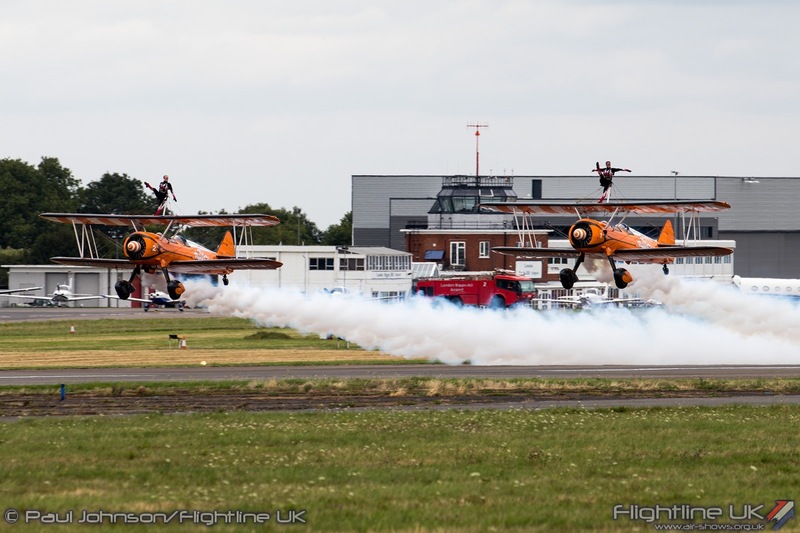 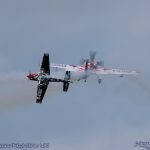 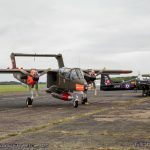 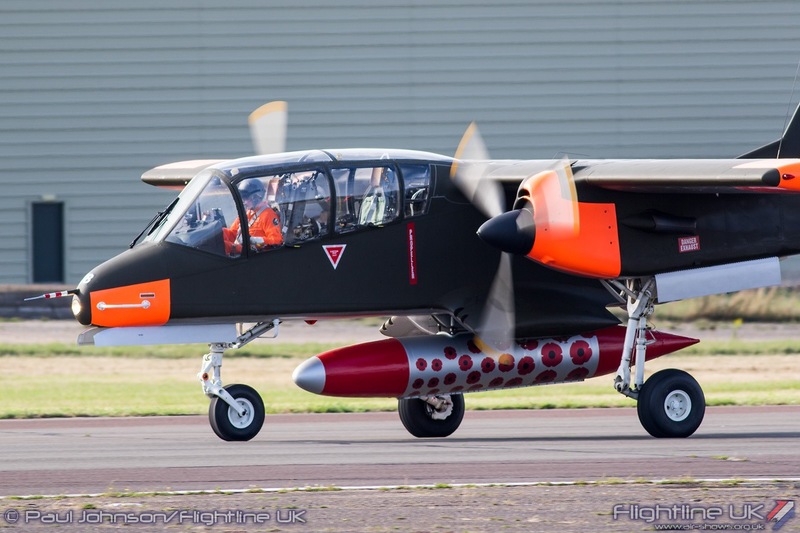 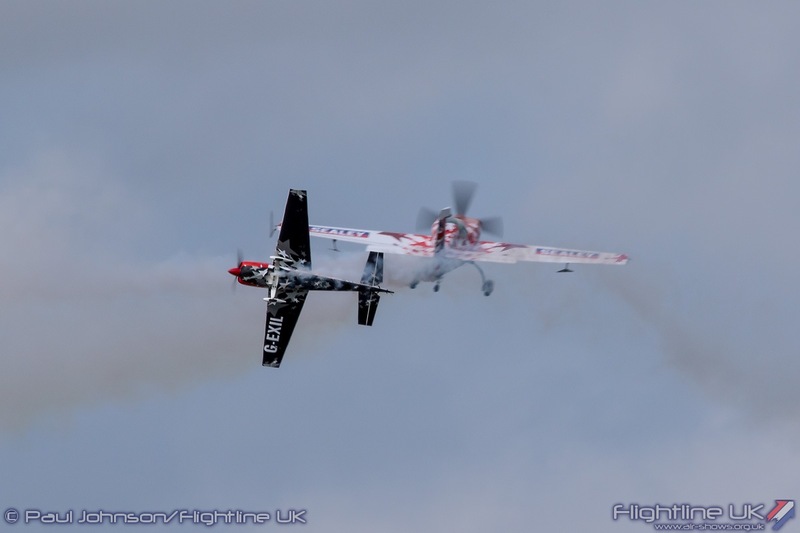 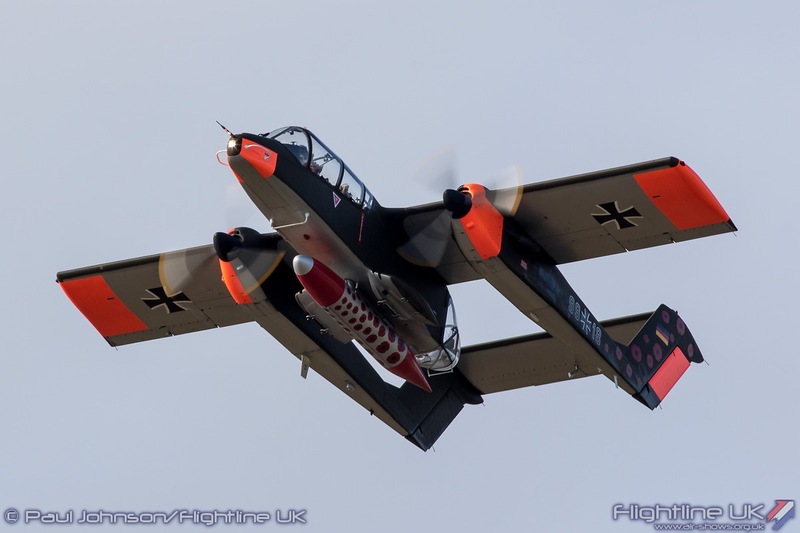 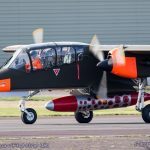 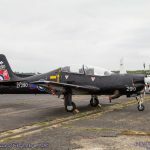 The Bronco Demo Team have become a Biggin Hill favourite in recent years and it was great to see them back with their colourful North American OV-10B Bronco. 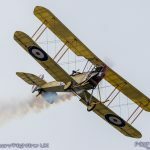 2018 is a particularly significant year in their home country of Belgium as it marks the centenary of the final First World War battles and the signing of the Armistice. 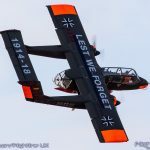 To mark the 100thanniversary of the Great War, the Bronco has been adorned with poppies and the text “Lest we Forget” over the top surfaces. 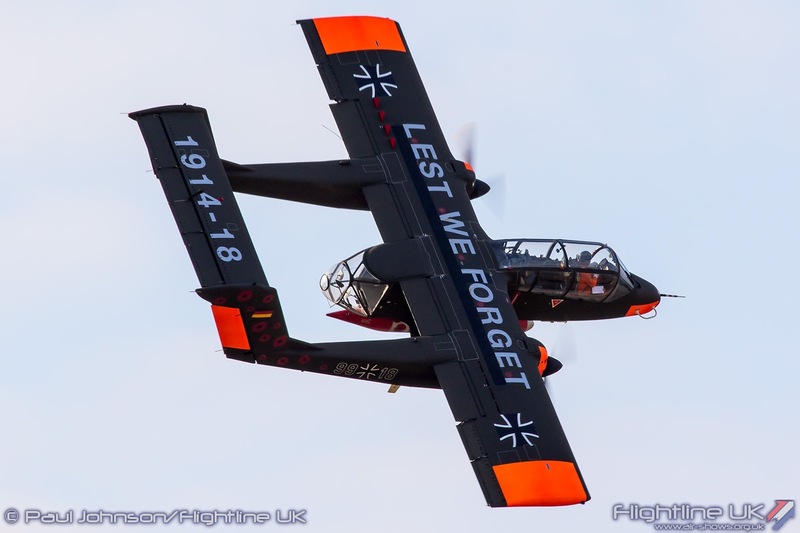 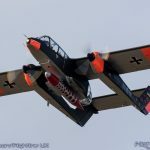 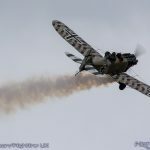 Pilot Tony de Bruyn gave a spirited display in the ex-Luftwaffe target tug demonstrating the agility that made the aircraft such an effective close air support aircraft. 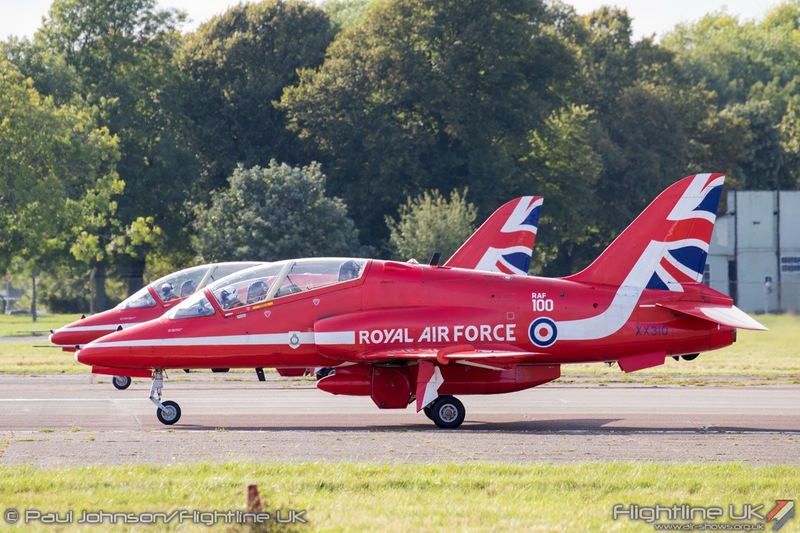 The modern day Royal Air Force also participated in the flying displays over the weekend. 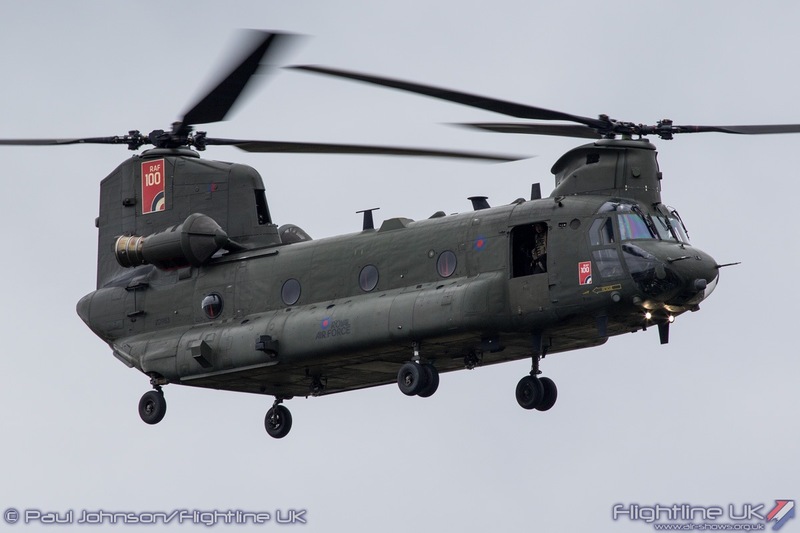 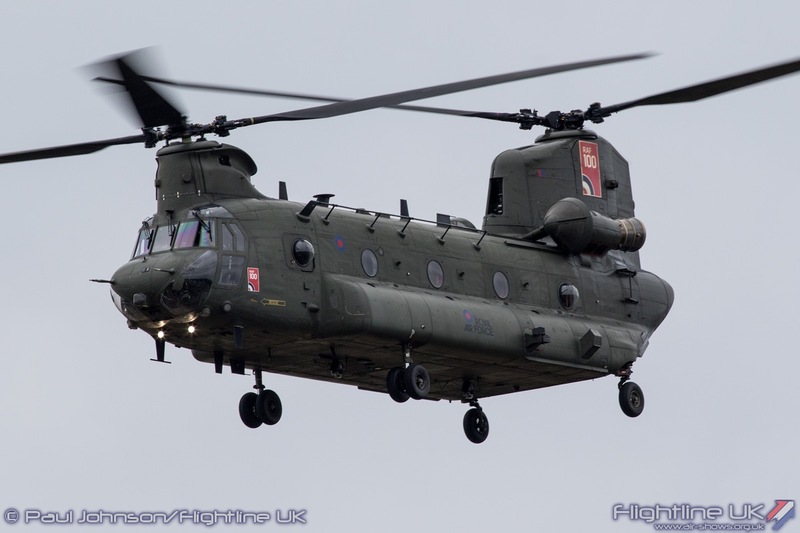 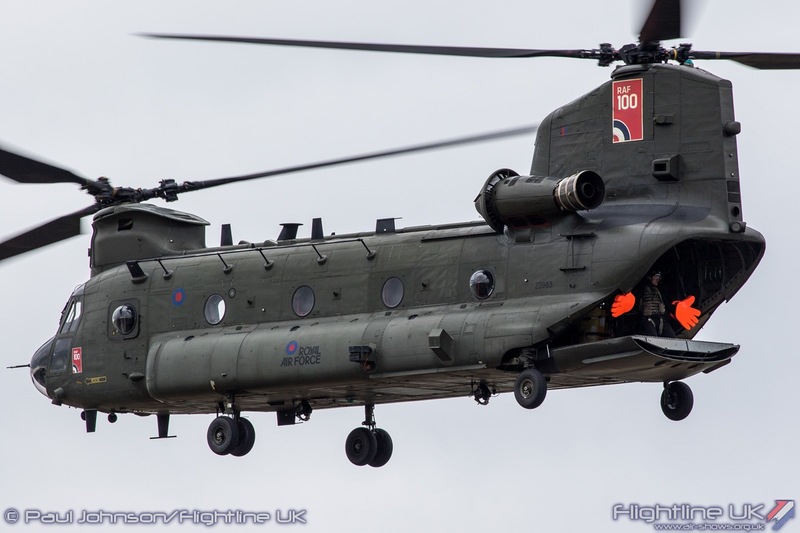 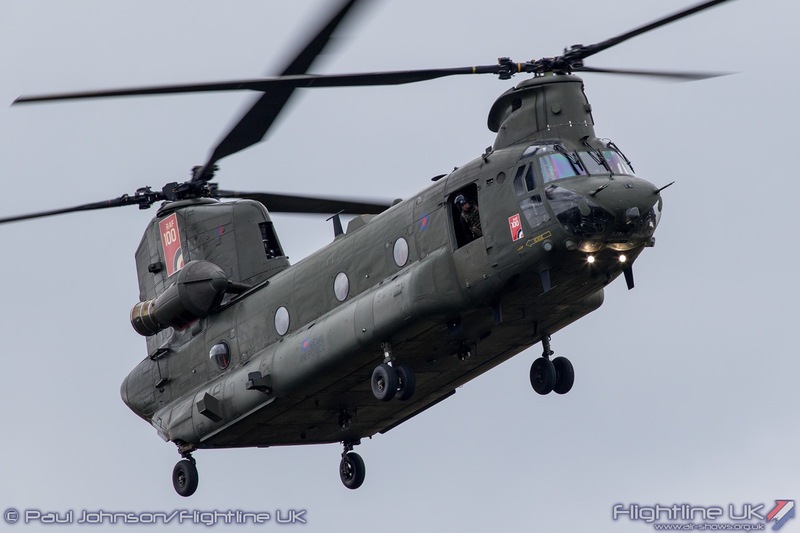 Saturday saw a display from the RAF Odiham based Boeing Chinook HC6A. 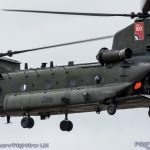 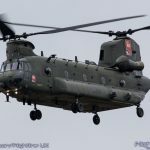 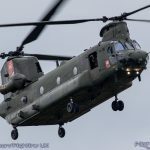 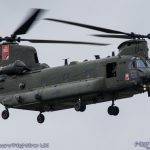 The Chinook is always an impressive performer at airshows creating plenty of noise with its trademark “bladeslap” and huge presence in the sky. 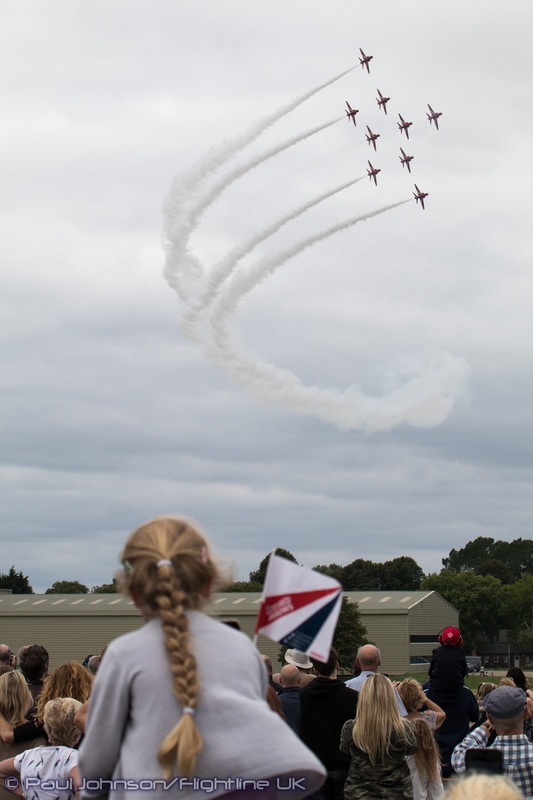 Sunday’s display saw a further representative of the modern-day RAF with a flypast from the Eurofighter Typhoon FGR4 performing a single flypast at the end of the flying displays. 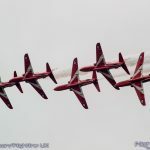 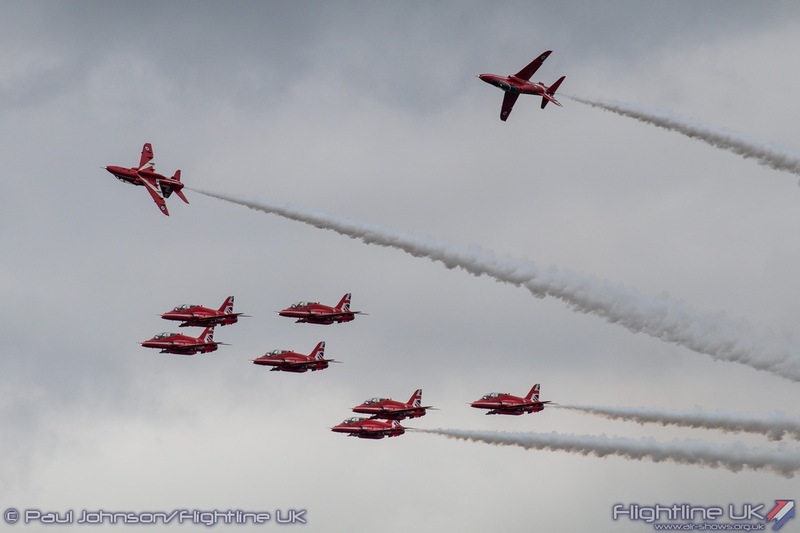 The stars of the show were of course the Red Arrows. 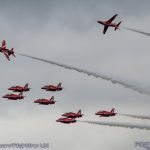 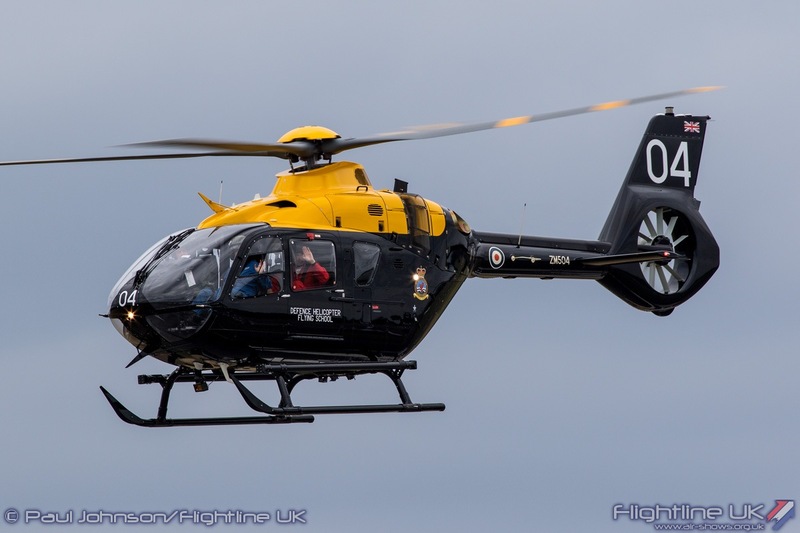 Even though the team are restricted to their rolling display due to the London airspace above, it is always special seeing the team at Biggin. 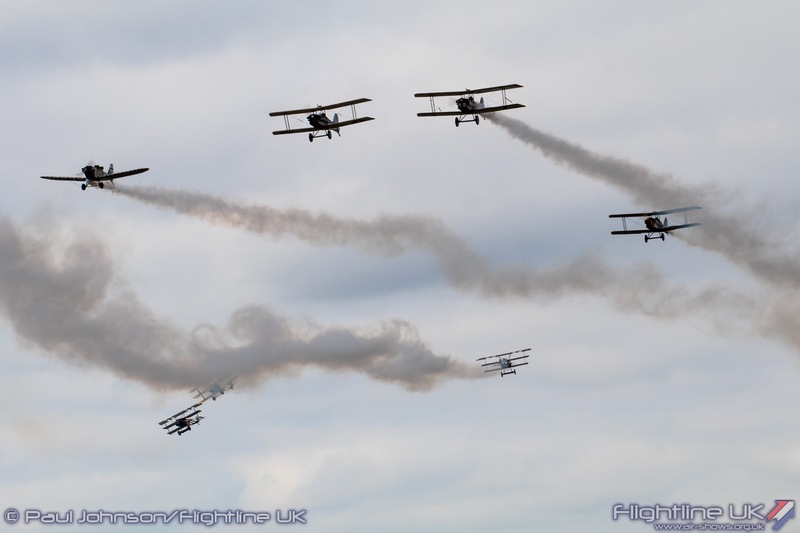 Following their formation in 1965, it was at Biggin the team performed for the first time in the UK. 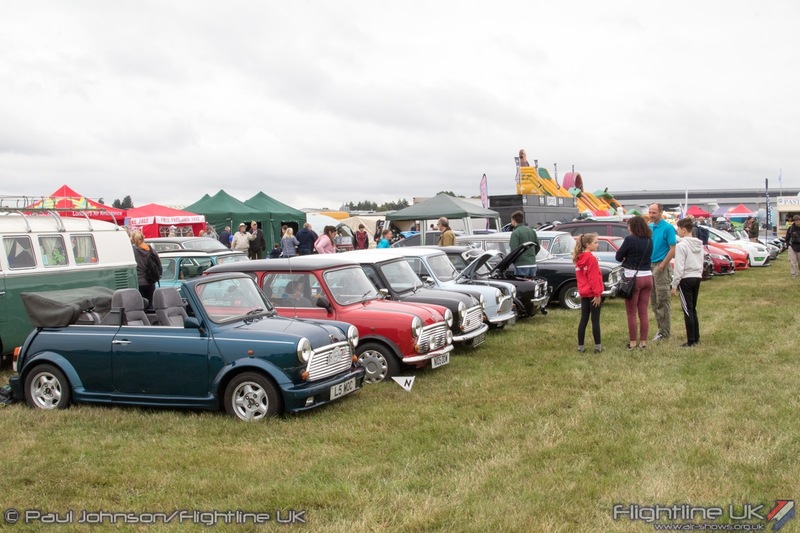 They have been back to Biggin most years since and are always the biggest draw for the crowds. 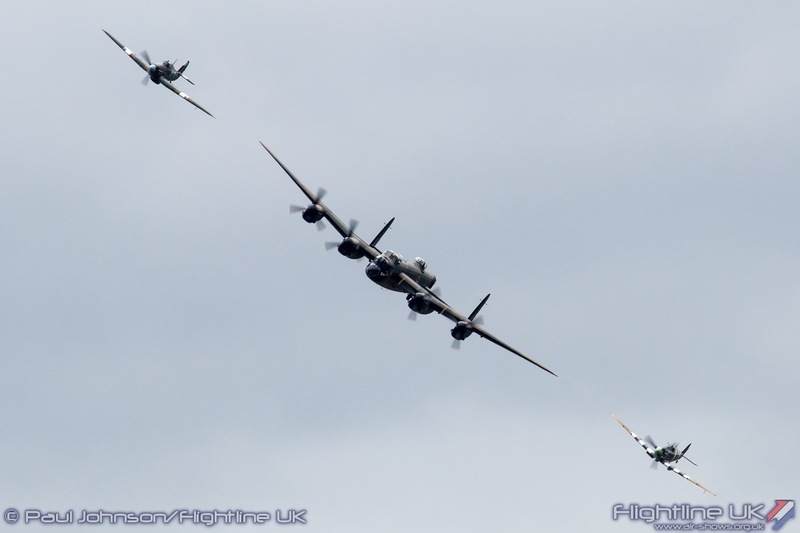 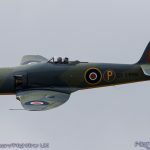 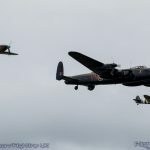 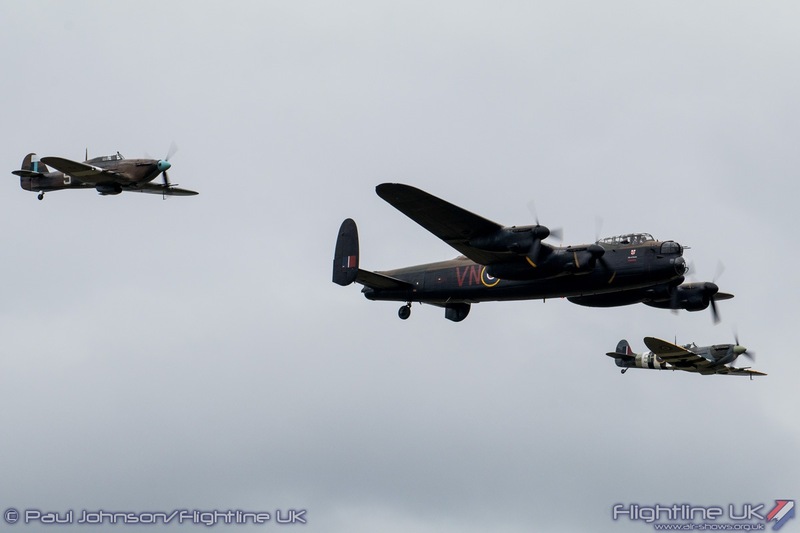 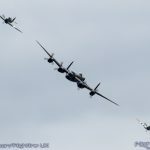 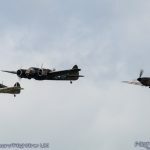 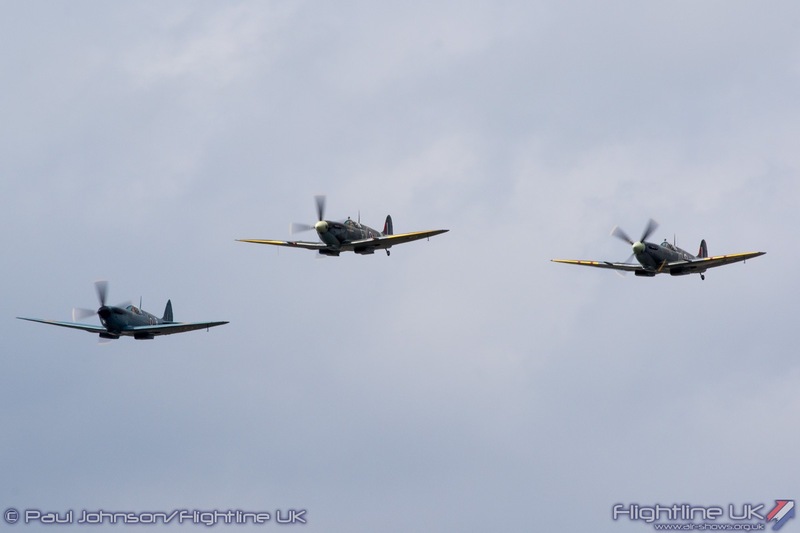 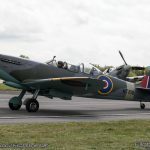 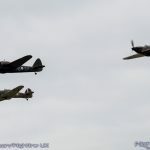 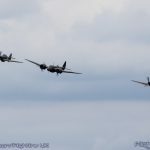 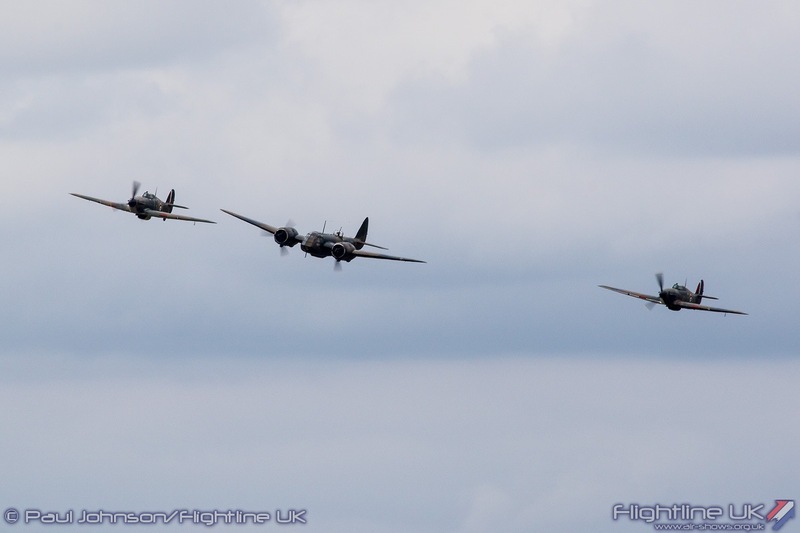 The Royal Air Force also contributed to the impressive warbird line-up with the Battle of Britain Memorial Flight who presented their standard three-ship of Avro Lancaster B1, Supermarine Spitfire Vb and Hawker Hurricane IIc. 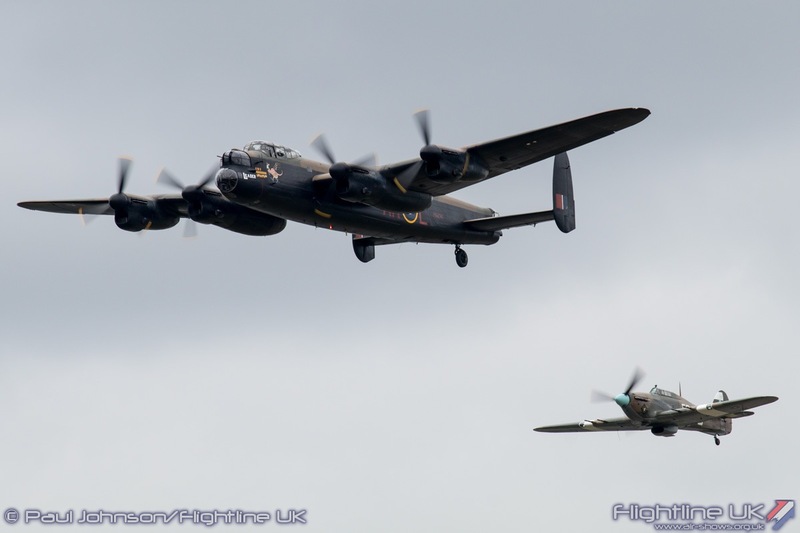 Incredibly, this was the first time the Lancaster had properly participated in the Festival of Flight. 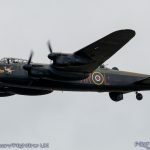 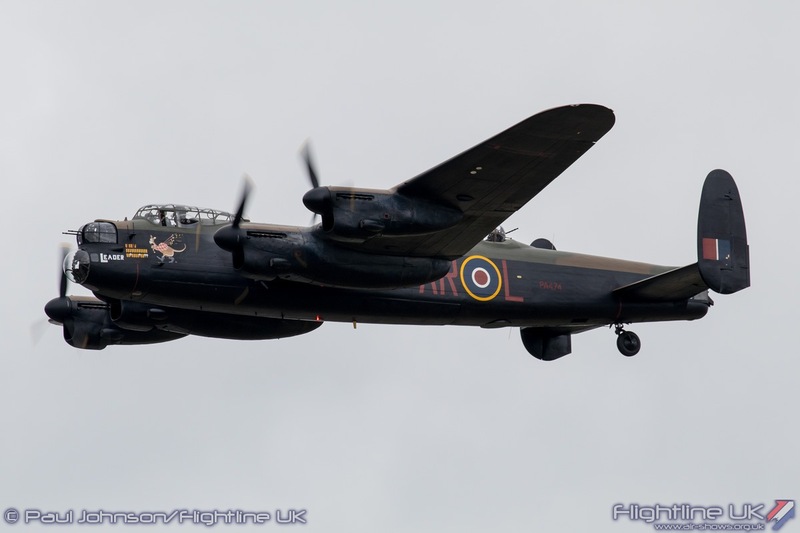 During the first year of the event, the Lancaster did depart from the airfield to take part in the Queen’s Birthday Flypast but has missed every event since for various reasons. 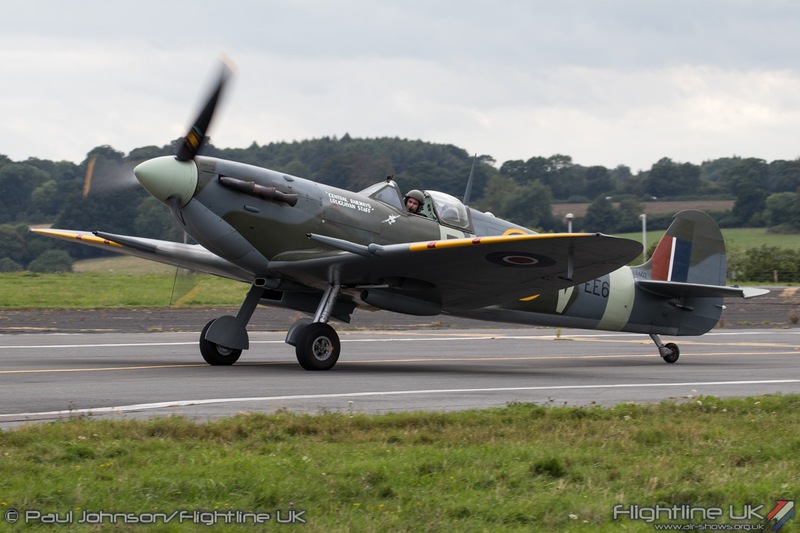 An added bonus for Sunday’s audience was to see both the fighters land after their delayed display adding to the large collection of Spitfires and Hurricanes gathered for the events centrepiece. 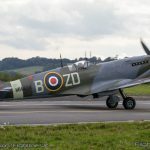 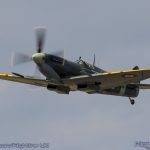 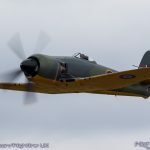 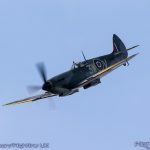 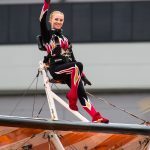 However, the main event of the flying display was the Battle of Britain salute and re-creation of “The Hardest Day.” The sequence told the story of how pilots trained for and flew combat operations. 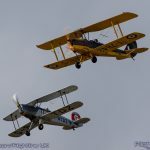 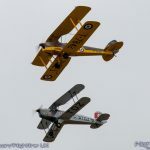 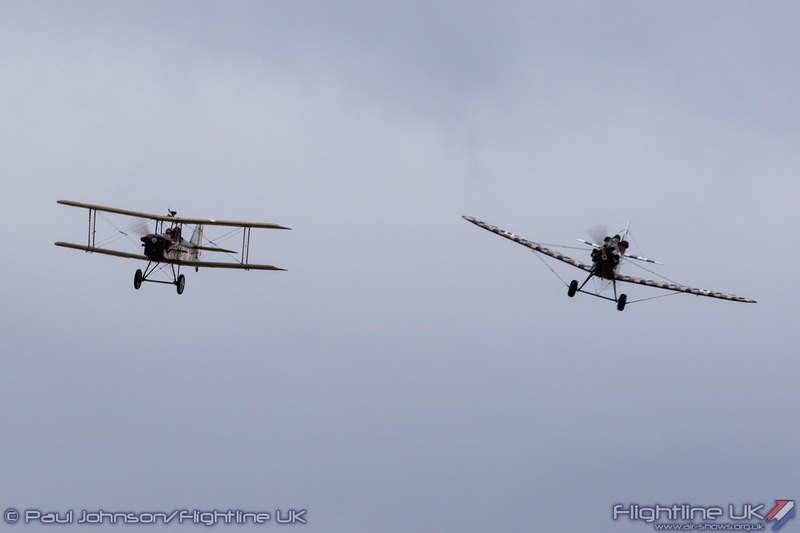 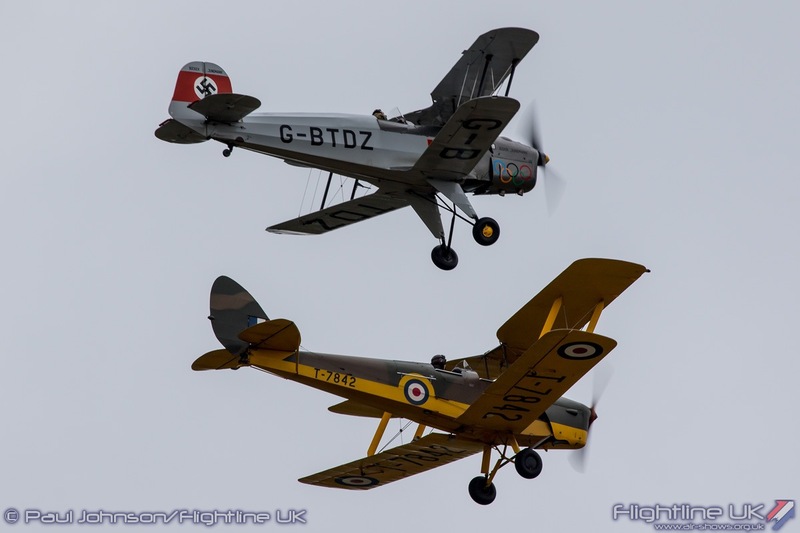 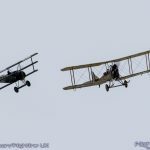 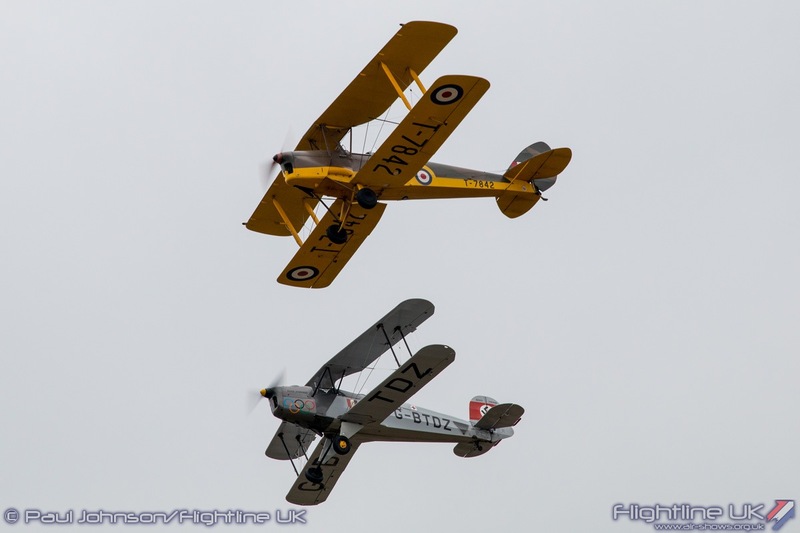 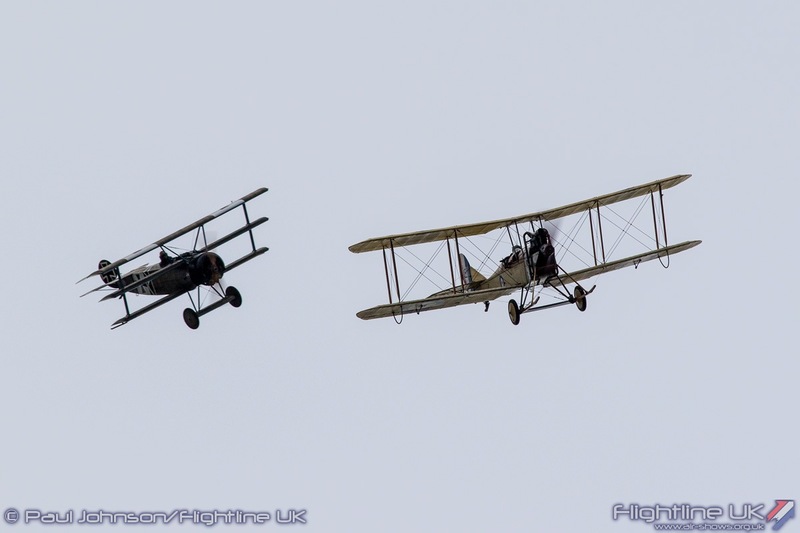 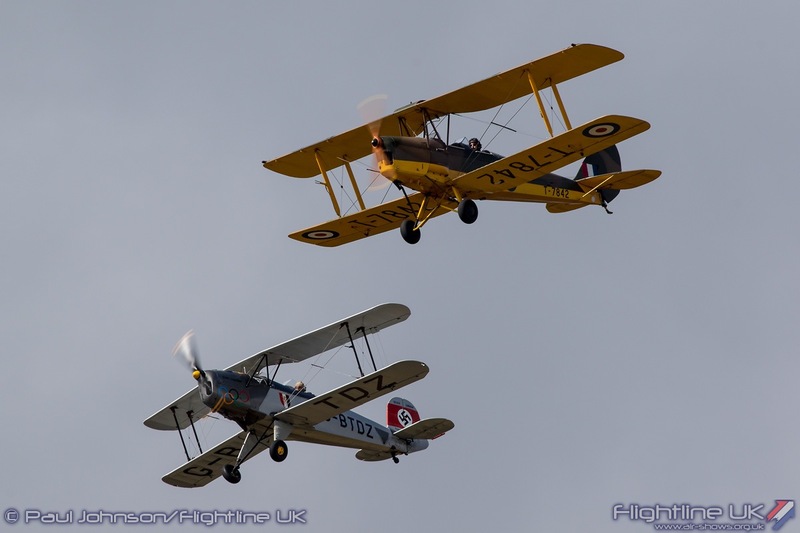 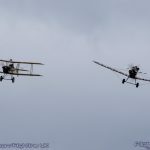 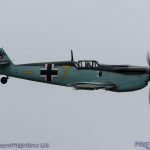 It opened with a pair of aircraft marking the basic trainers flown by pilots on both sides, the de Havilland DH82a Tiger Moth and the Bucker Bu131 Jungmann. 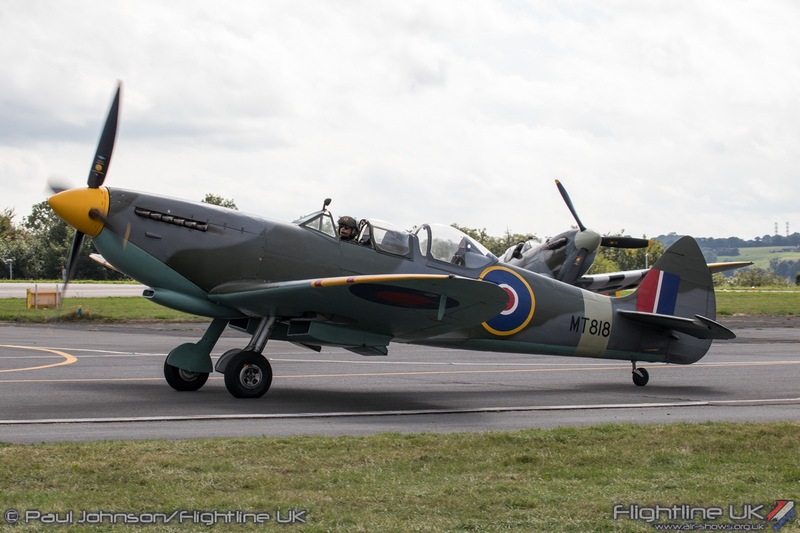 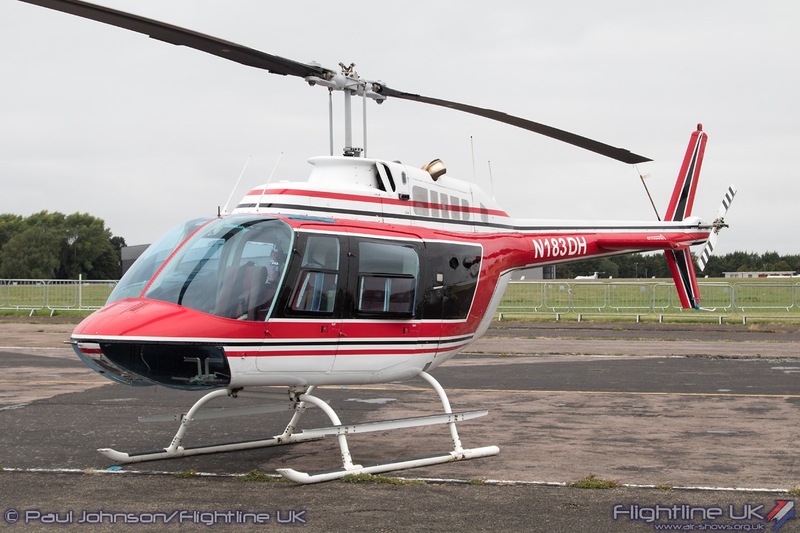 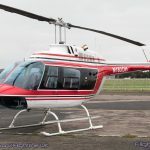 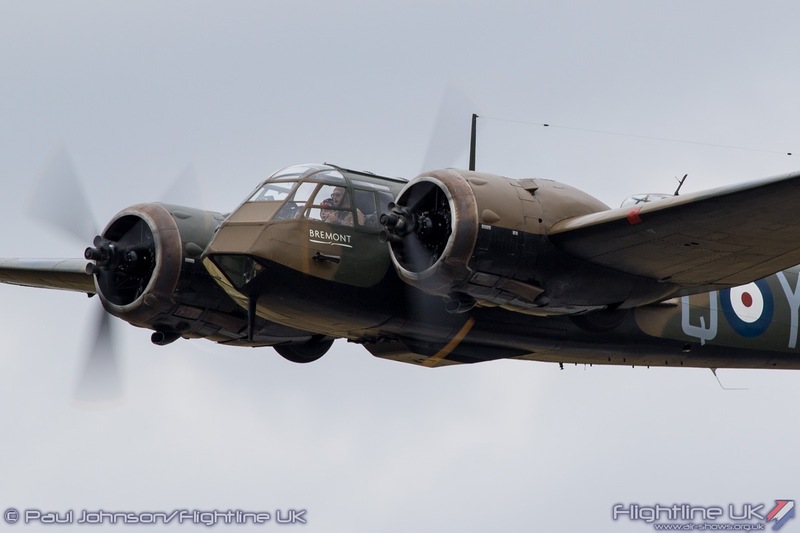 The pairing also had local connections to Biggin Hill with the aircraft piloted by father and son, Richard and Michael Pickin who are from local area. 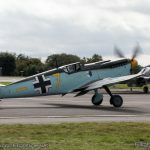 In between displays highlighting the build-up to the main raids of the Hardest Days, the airfield was “attacked” by Anglia Aircraft Restoration’s Hispano HA1112-M1L Buchon “Yellow 7” flown by Richard Grace. 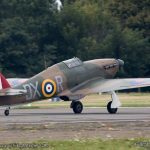 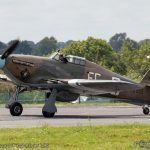 His first attacks were repelled by two early war examples of the Hawker Hurricane with the Biggin Hill Heritage Hangars Mk.X flown by Ian Smith and Anglia Aircraft Restoration’s Mk.1 flown by Alex Smee. 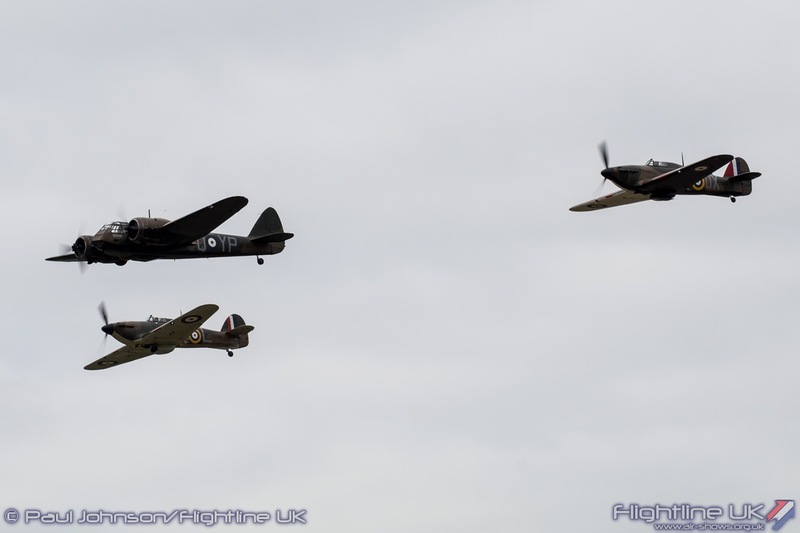 With the Buchon attack subdued for a few minutes, the Hurricanes joined up with the Aircraft Restoration Company’s Bristol Blenheim 1F flown by John Romain for some lovely formation passes. 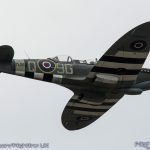 The latter stages of the set-piece saw further “attacks” from the Buchon before a first section of Spitfires took to the air to repel the attack. 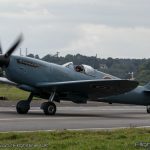 The Hangar 11 Supermarine Spitfire PRXI flown by Peter Teichman and OFMC’s Spitfire IX MH434 piloted by Steve Jones provided some top cover as Dan Griffith flew his Spitfire XVI TB885 in twisting dogfight with the Buchon. 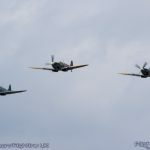 A further four-ship of the BHHH Spitfire IX, Spitfire XVI, Spitfire Mk VIII Trainer and Spitfire IXT together Anglia Aircraft Restoration’s Spitfire Vc got airborne underneath in a “survival scramble” to avoid the main bomber attack. 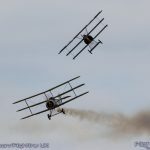 This was simulated by some truly incredible pyrotechnic explosions on the far side of the airfield once the aircraft had got away. The set-piece was closed in the traditional way with a tail-chase by the second section of Spitfires while the first section flew top-cover. 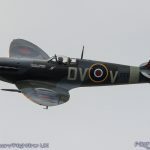 The sight of so many Spitfires over Biggin Hill will always be an emotive experience and a fine ending to a salute not only to the Royal Air Force, but also to many people who played an important role supporting RAF Biggin Hill during the uncertain times of 1940. 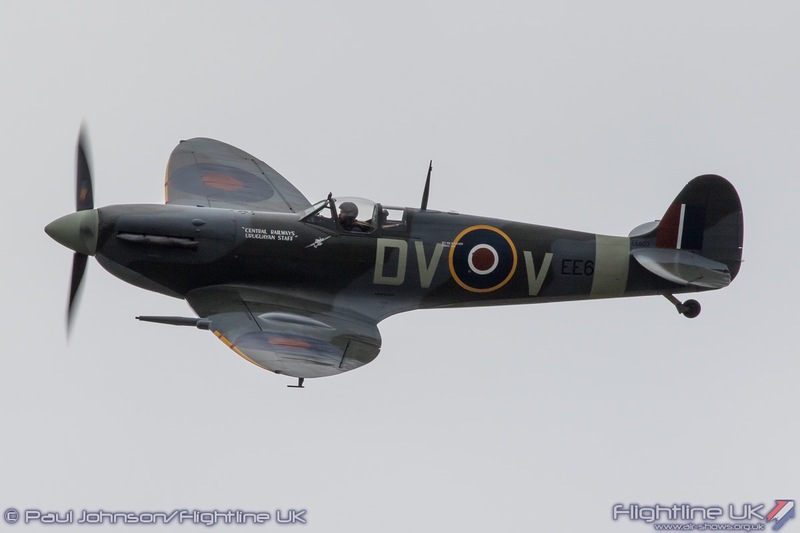 As is tradition at Biggin Hill, both days flying displays were closed by a Spitfire solo. 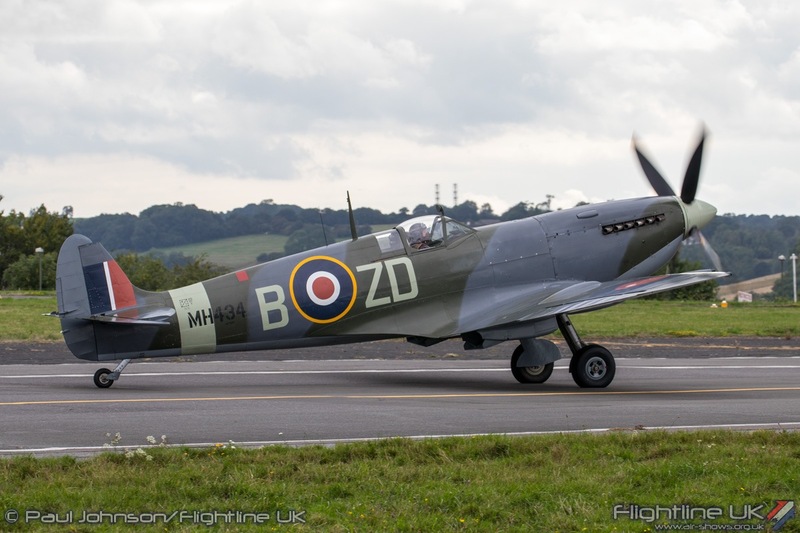 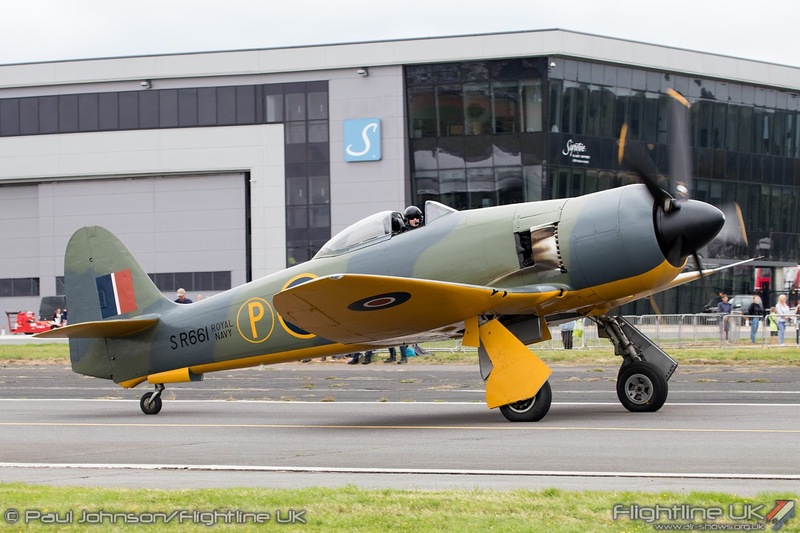 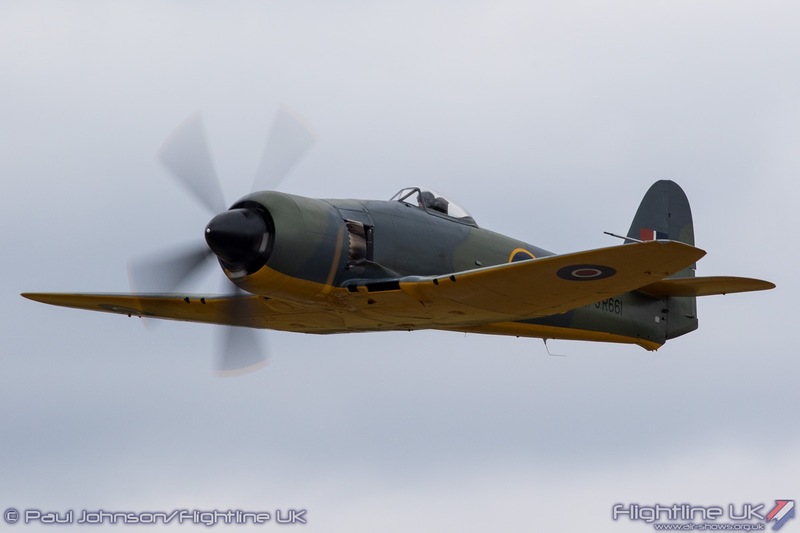 The display was flown by the Biggin Hill Heritage Hangar’s chief pilot, Dan Griffith. 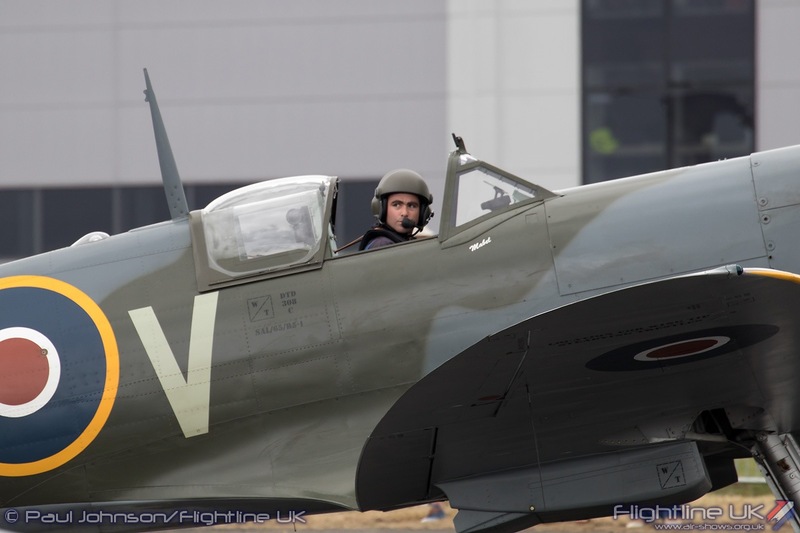 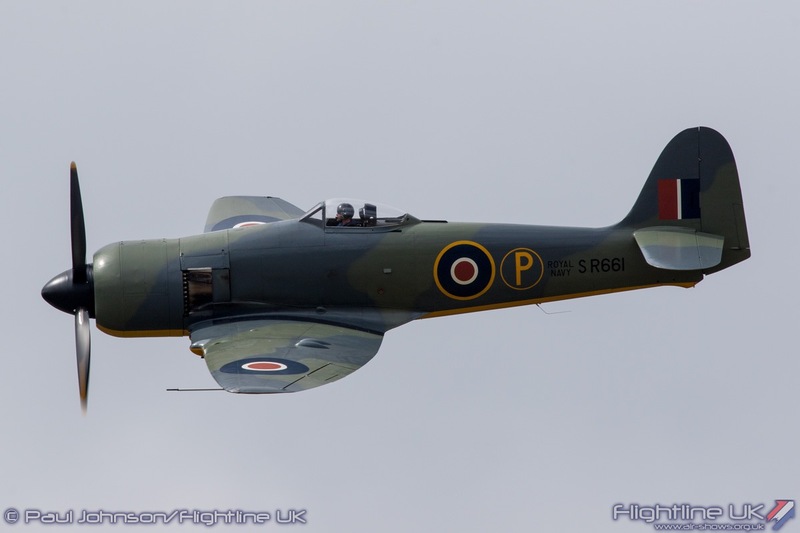 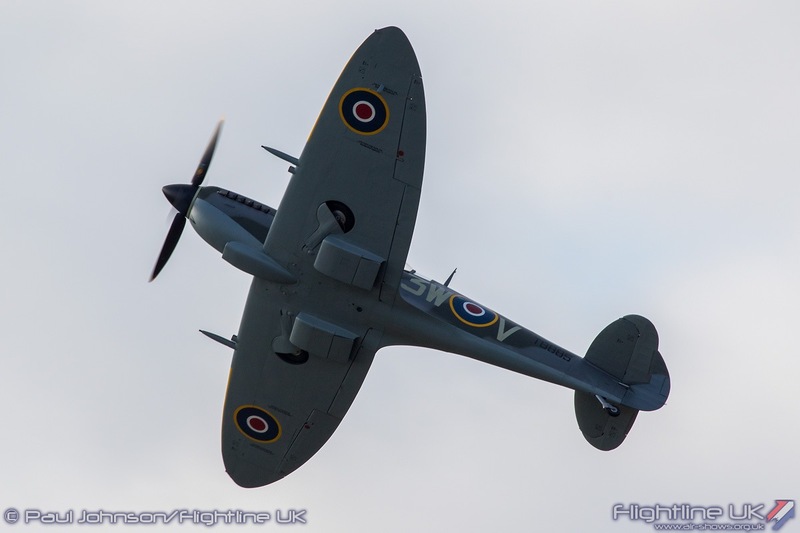 On the Saturday he flew the Hangar’s latest restoration, Supermarine Spitfire XVIe TB885. 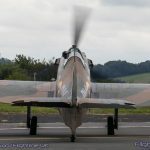 As ever Dan’s display really shows off the Spitfire’s abilities as a fighter with fast direction changes and tight turns plus half Cuban eights. 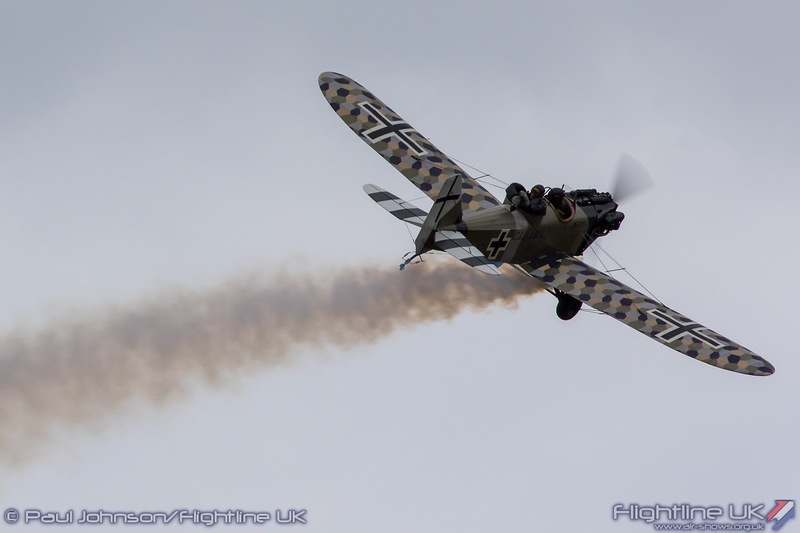 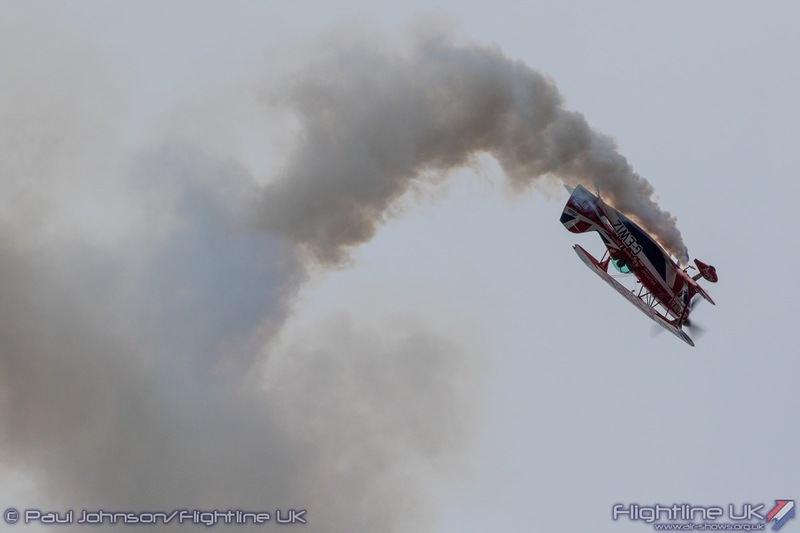 As he ended display on the Saturday however there was a little bit of drama as the aircraft’s engine started to run a little rough and leave a thin dark trail in the sky. 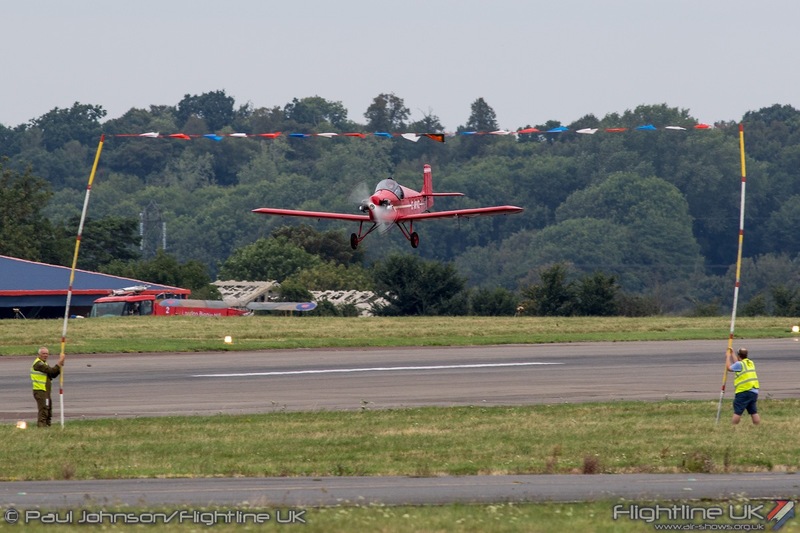 Dan coolly flew around the Biggin circuit to land on the runway but it was little bit of a nervy moment for those watching on! 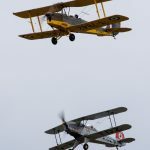 Few other shows have put on a set-piece display quite like that seen at Biggin to celebrate the 100th Anniversary of the Royal Air Force. 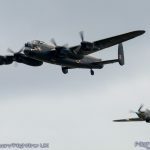 The impressive collection of warbirds plus the incredible pyrotechnics certainly made for a very memorable display that marked perhaps the most significant moment in RAF history. 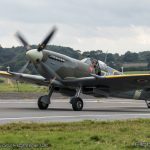 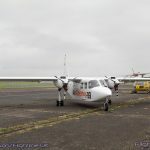 Coupled with the relaxed and varied afternoon flying display made for a very enjoyable day out at the famous Kent airfield.